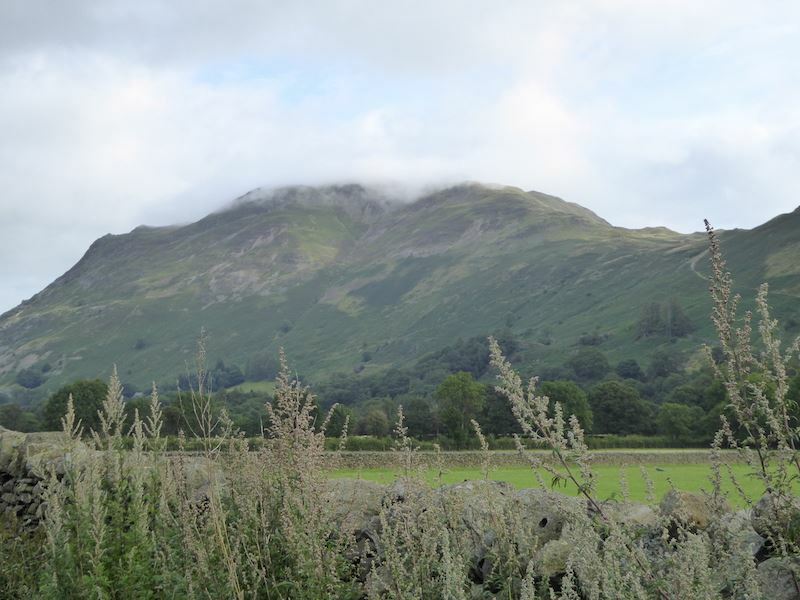 Cloud drifting over Place Fell as we get ready to start the walk. 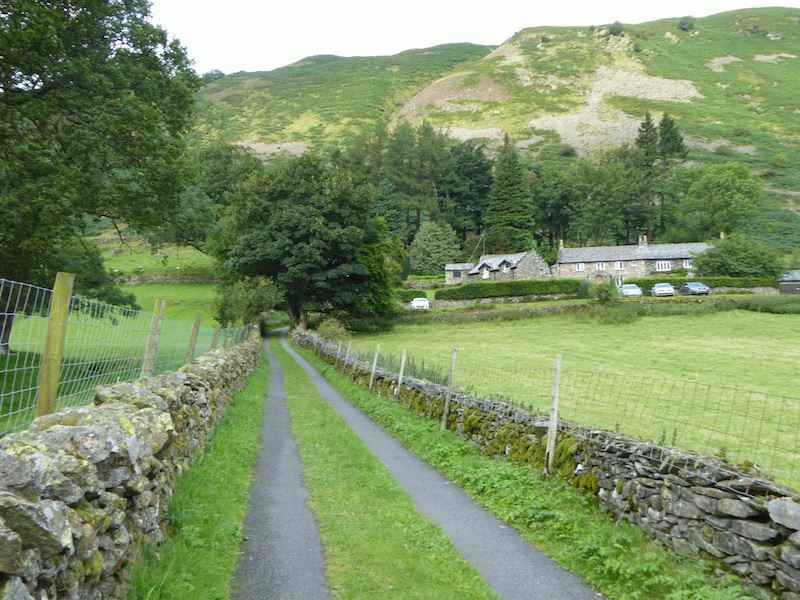 Walking down the lane from Deepdale Bridge to make our way into Deepdale. 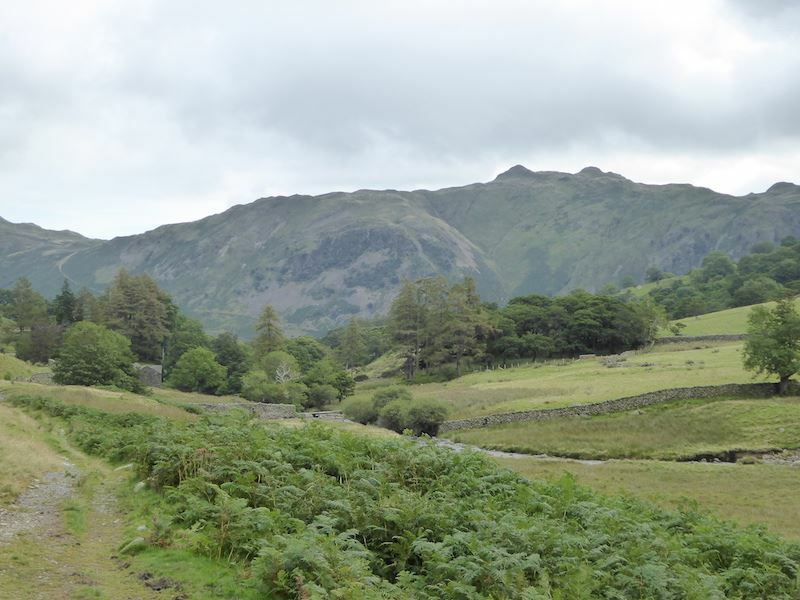 Over to our right is Arnison Crag. 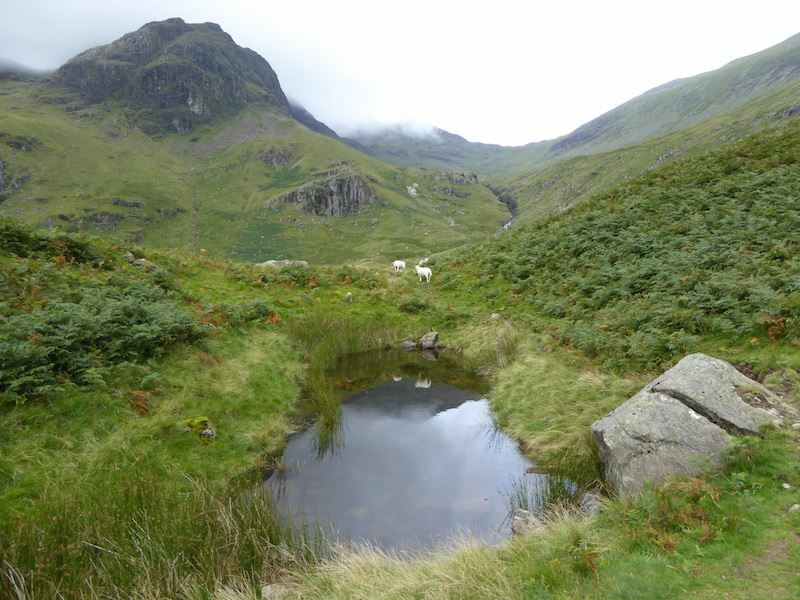 The sheep in the bottom left of the shot isn’t dead, its just fast asleep. 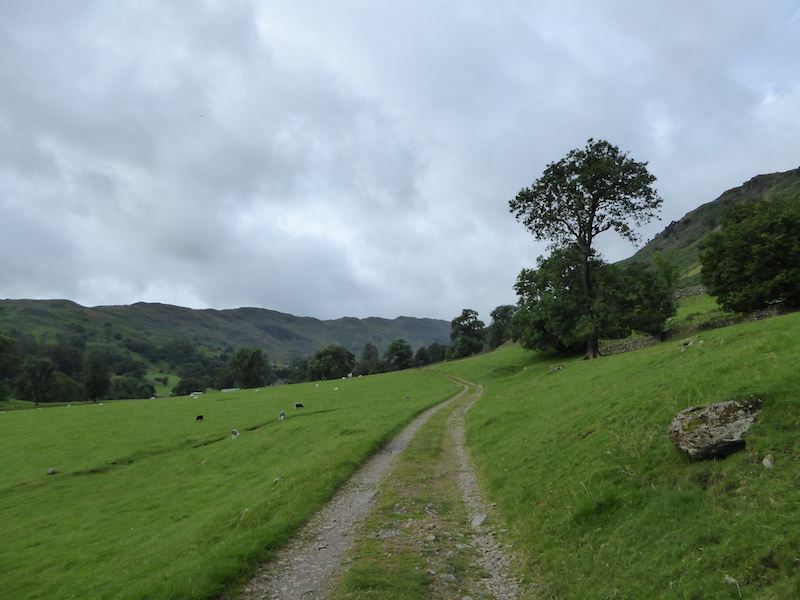 At the end of the lane we take a left turn onto the farm track and enter Deepdale, with the long ridge of Hartsop above How over on the left. 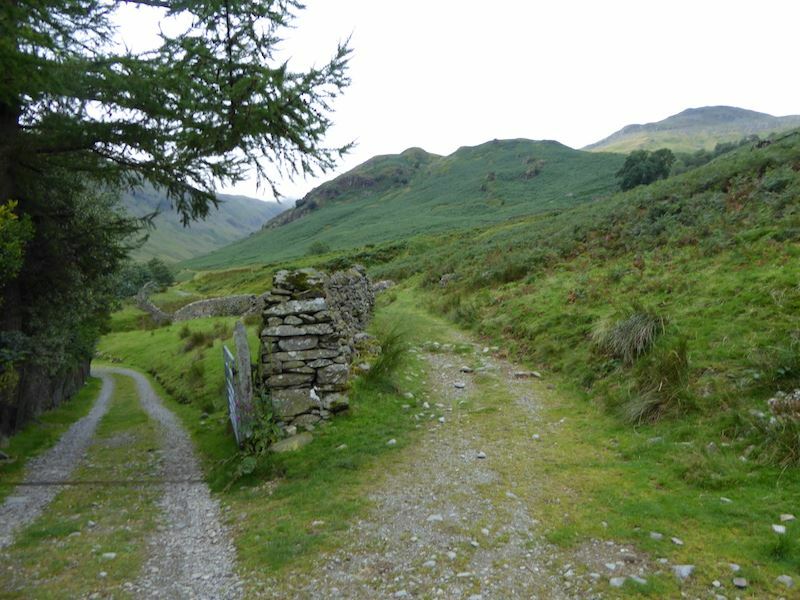 Further along and there’s a path junction, take the left path for the farm or the right path for the route into Deepdale. 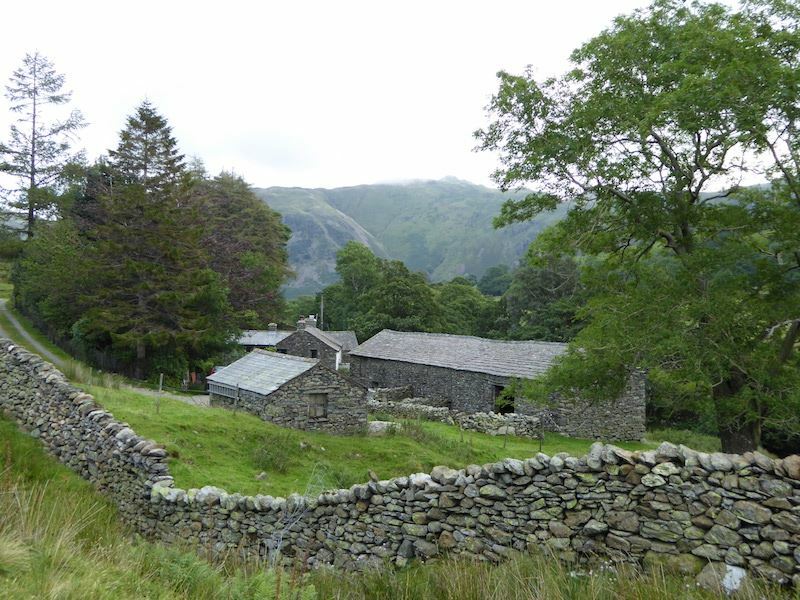 We took the right hand path which passed above Wall End farm. 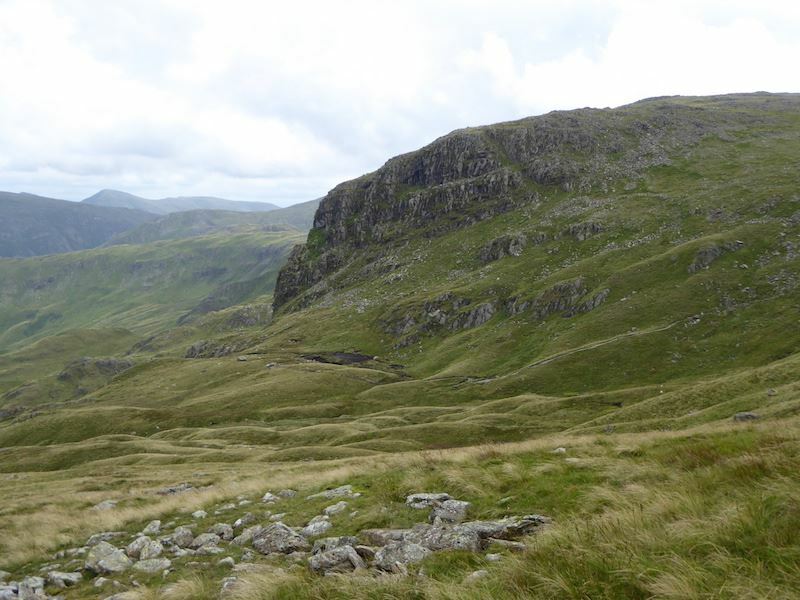 Looking up at Latterhaw Crag and Lord’s Seat, and peeping behind them over on the right, is Saint Sunday Crag . Looking back down the path there’s a good view of Angletarn Pikes over on the right skyline. 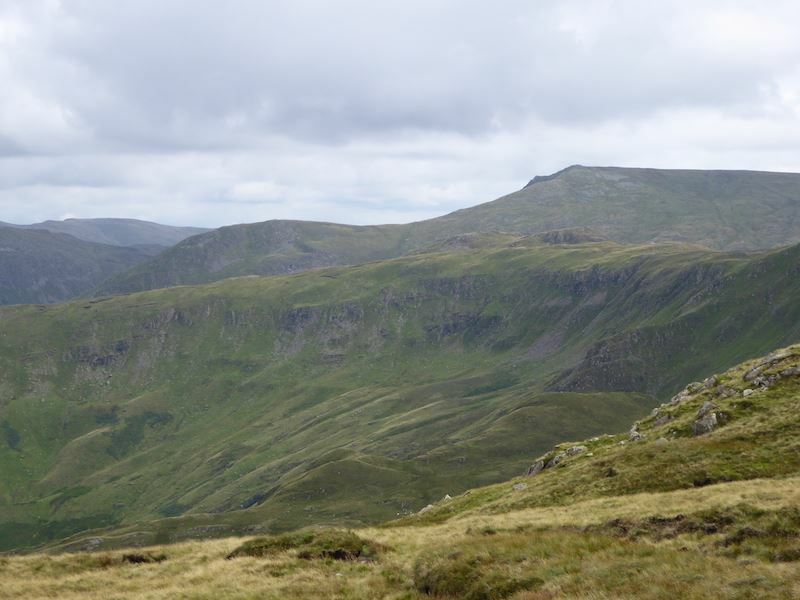 The bulk of Greenhow End in, the centre, with cloud covering Hart Crag and Cofa Pike on either side of it. I’m hoping the cloud has gone by the time we get up there. 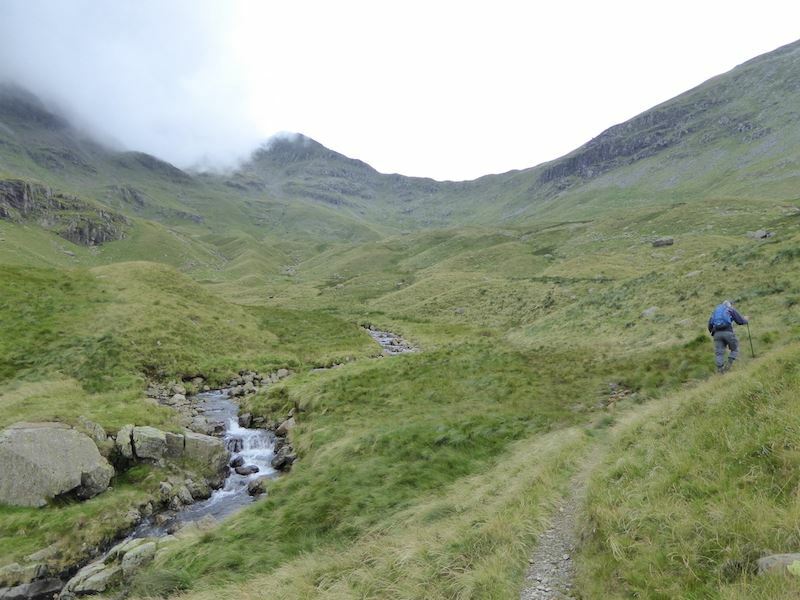 Further along into Deepdale and over on the right Cofa Pike is becoming a little clearer as the cloud thins a little. It was very wet underfoot along the valley today. Looking back down the valley with Angletarn Pikes still clear of cloud. 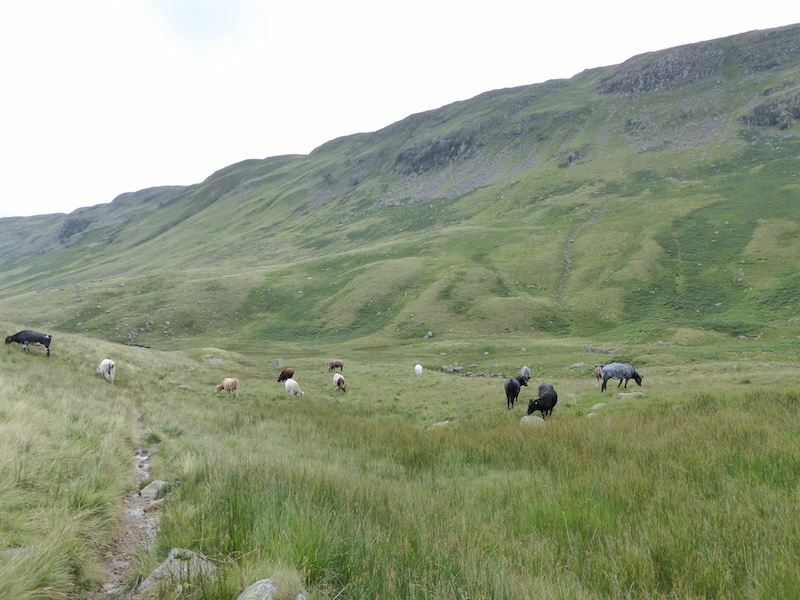 These cattle had added their own contributions to the path, it was everywhere. 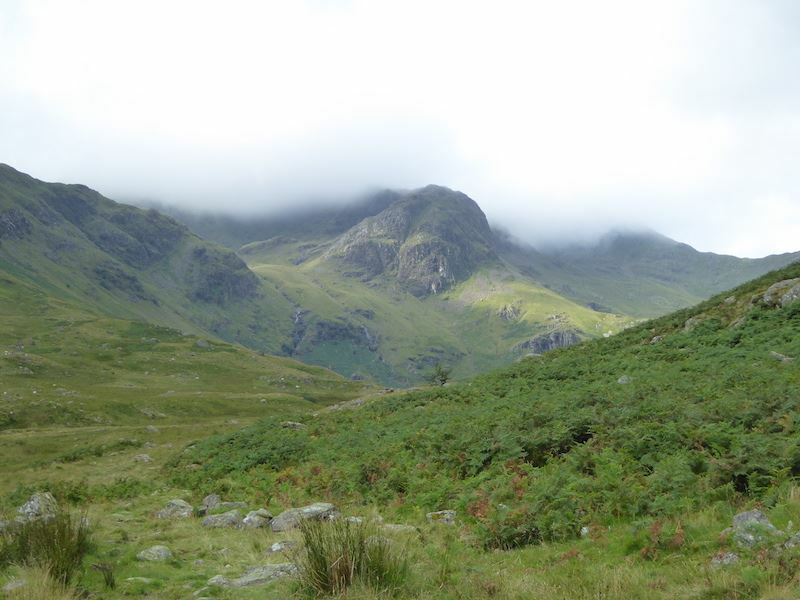 The moraines of Mossydale, sounds like a sitcom title. Greenhow End and some fellow travellers beyond the pool. Apart from the animals and ourselves there was no-one else around. 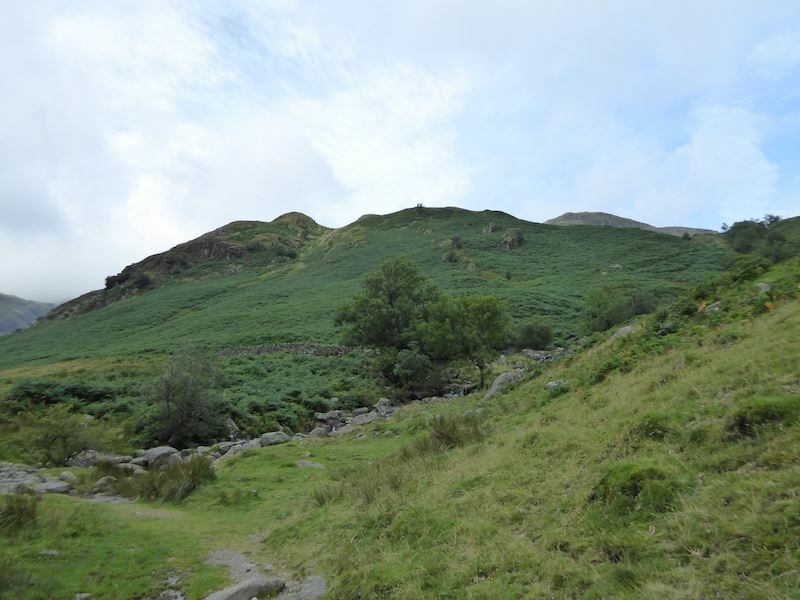 Some of Hart Crag appears over on the left of Greenhow End. 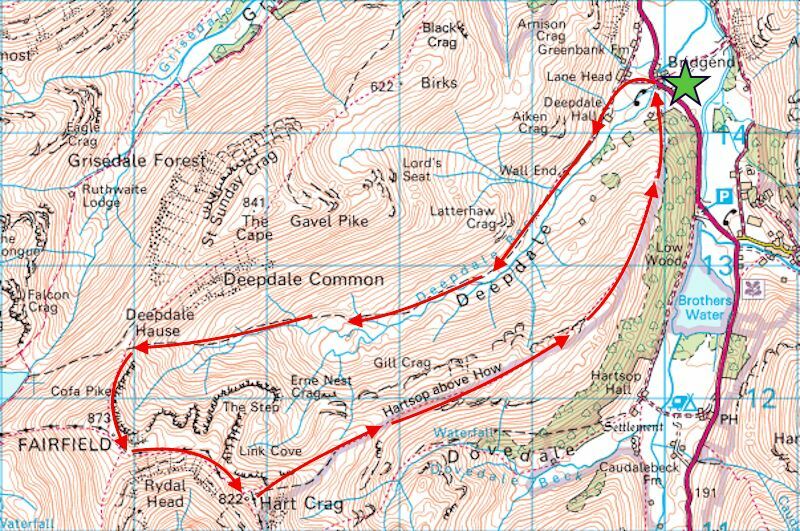 Our route will take us up alongside the beck you can see over on the right. 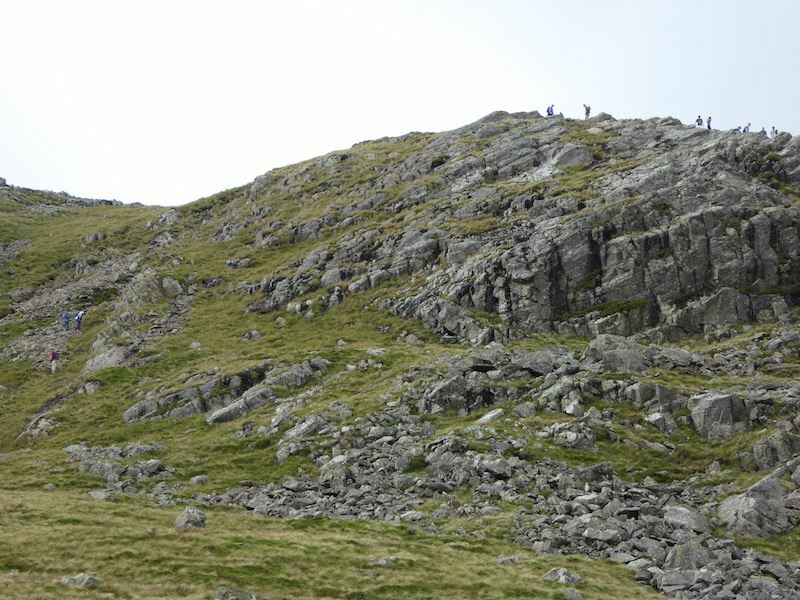 Now we have to climb the steep bit alongside the ravine to reach Sleet Cove. 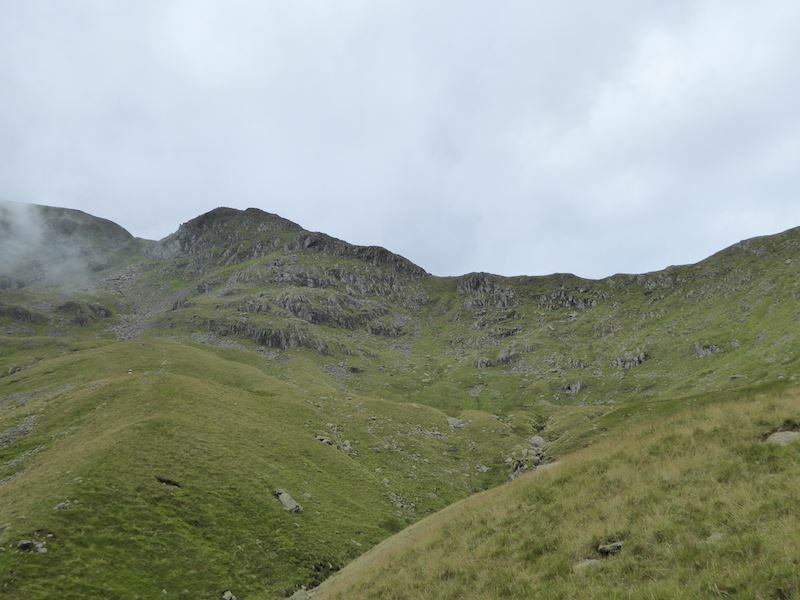 A view of the ridge of Hartsop above How as we look back into the aptly named Mossydale. 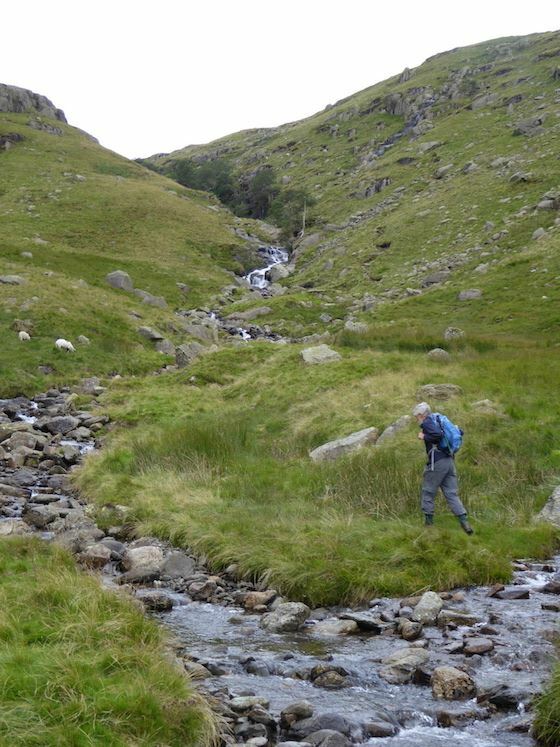 Making our way up towards the steeper section alongside the beck. 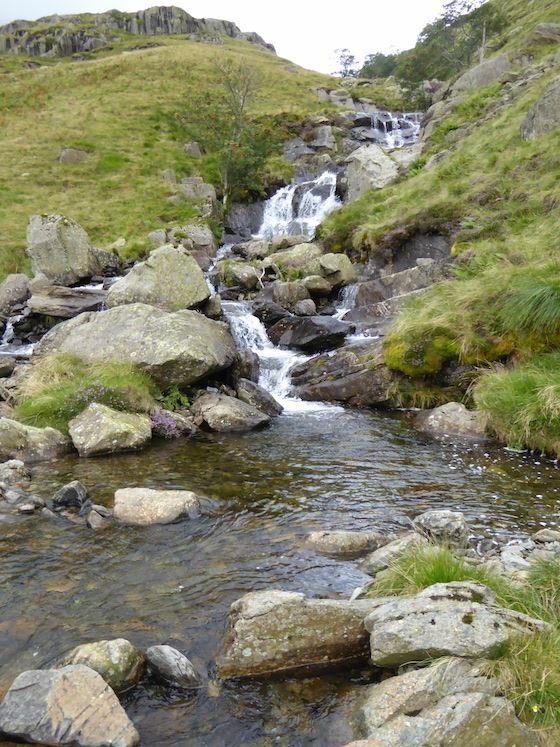 One of the many waterfalls in the beck. On the skyline straight across from us is Blake Brow. 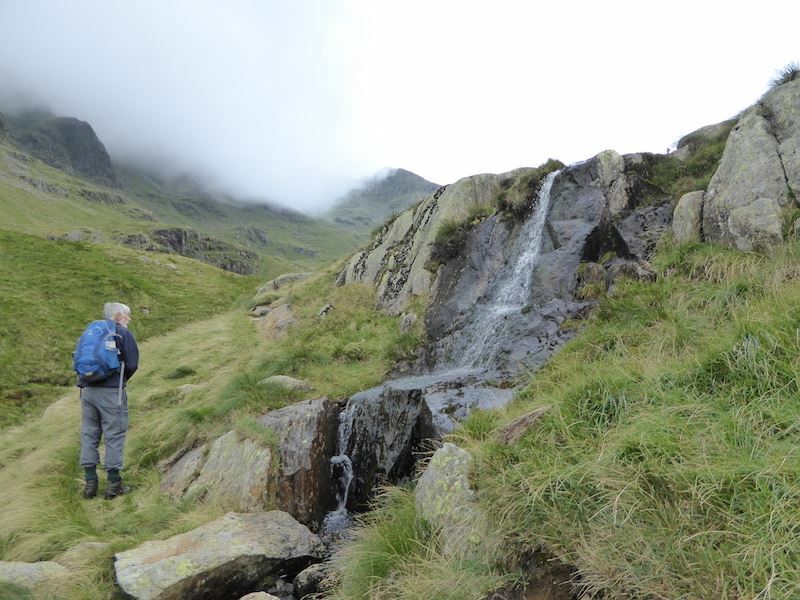 Still climbing alongside the ravine and we came upon this little cascade sliding its way down to the beck below. 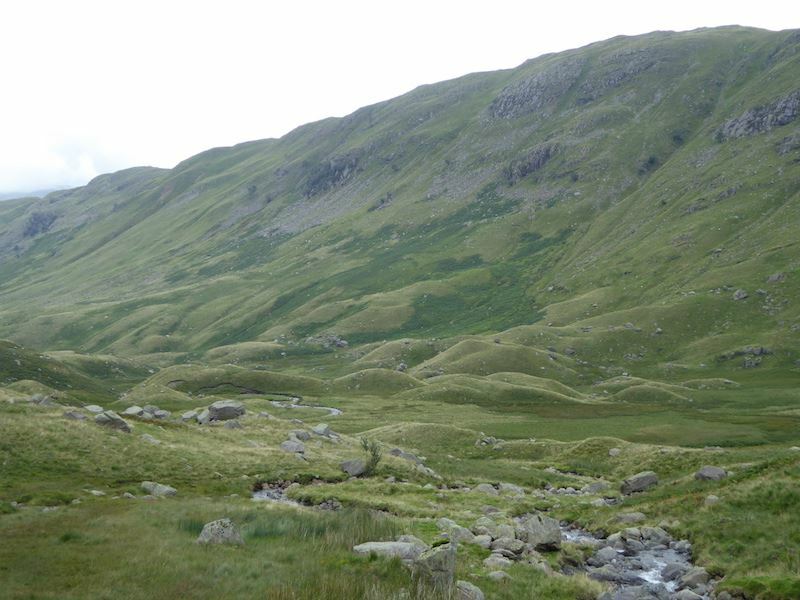 We’re above the ravine now, making our way into Sleet Cove and heading for the Hause, that’s the ridge line in the centre. It seems to be getting brighter but that cloud still keeps rolling in and out. 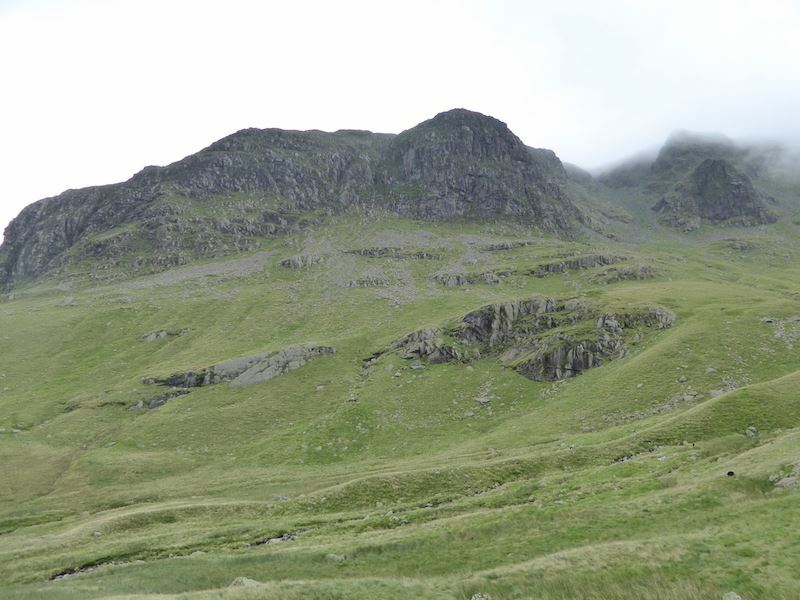 More imposing crags across the valley, cloud still swirling over and around them too. 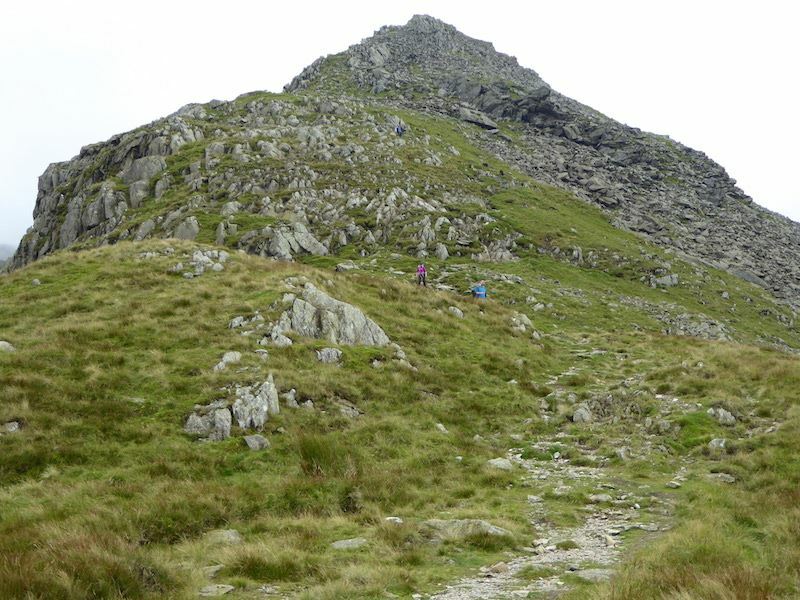 At last, a clear view of Cofa Pike, that’s where we’re heading but its still a bit of a way off. 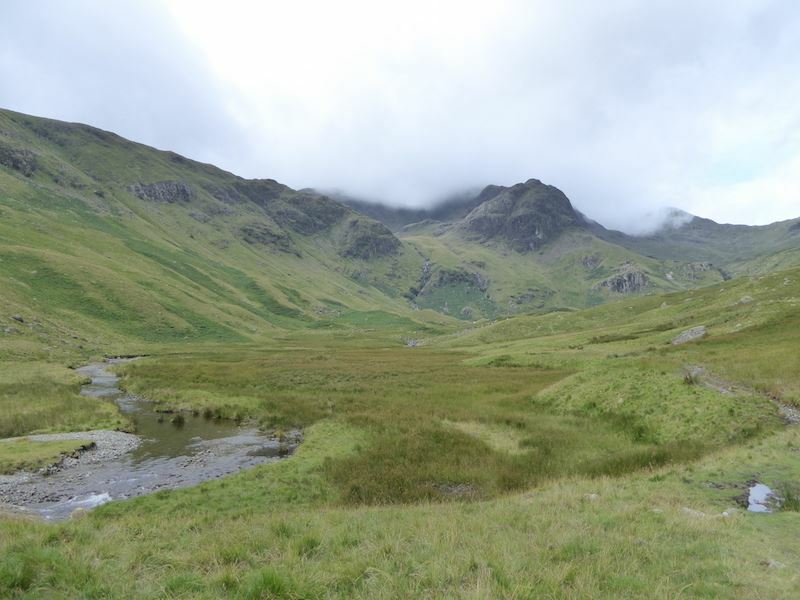 Sleet Cove and the ridge line of Deepdale Hause is getting closer. We are almost at the Hause and we pause to take in the view of Deepdale. 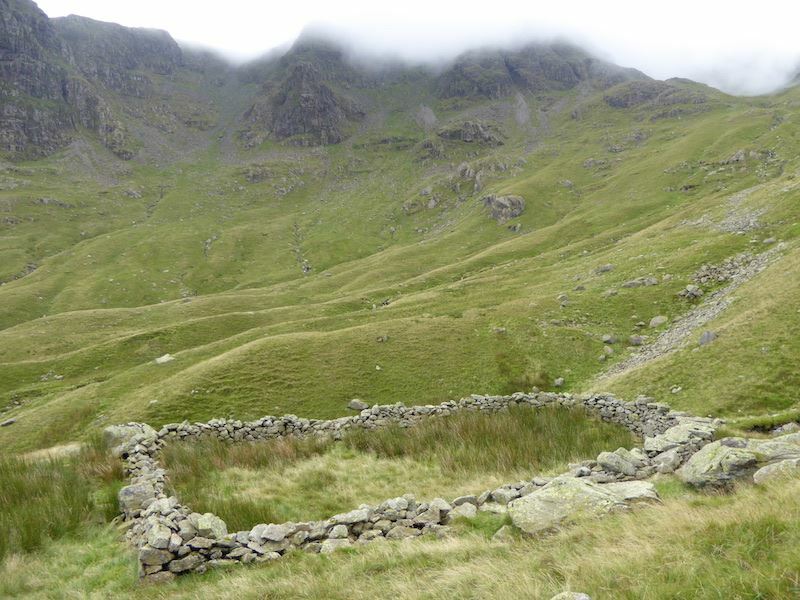 Around this point we met the first walkers of the day, a young couple about to descend into Deepdale from the Hause. After checking the route with us off they went, the young lad fairly bounding down, the young girl taking things much more carefully, good for her. 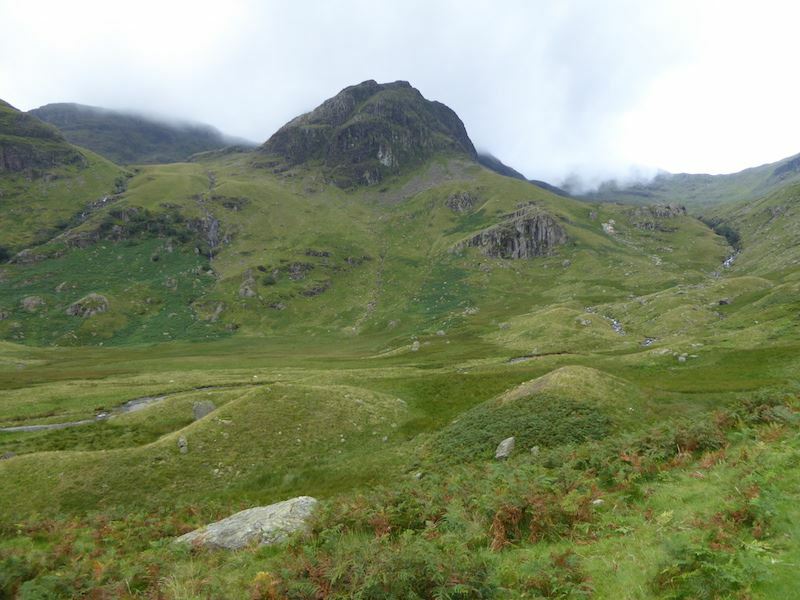 Saint Sunday Crag as we reach Deepdale Hause, from this point it is 3 miles back to the car. Time for a bit of a breather now we’re at the Hause so we had a look around. 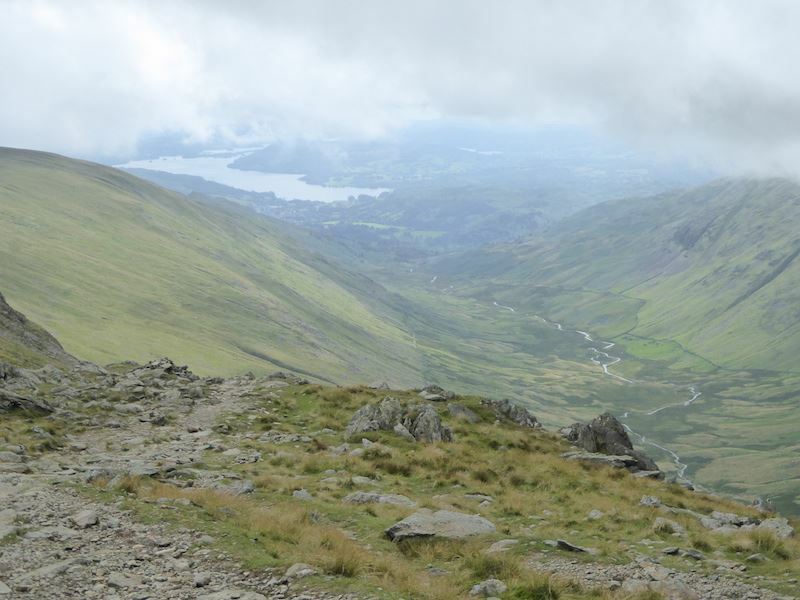 Looking west from left to right, are Dollywaggon Pike, Nethermost Pike and Helvellyn with the Striding Edge ridge going off to the right of the shot. 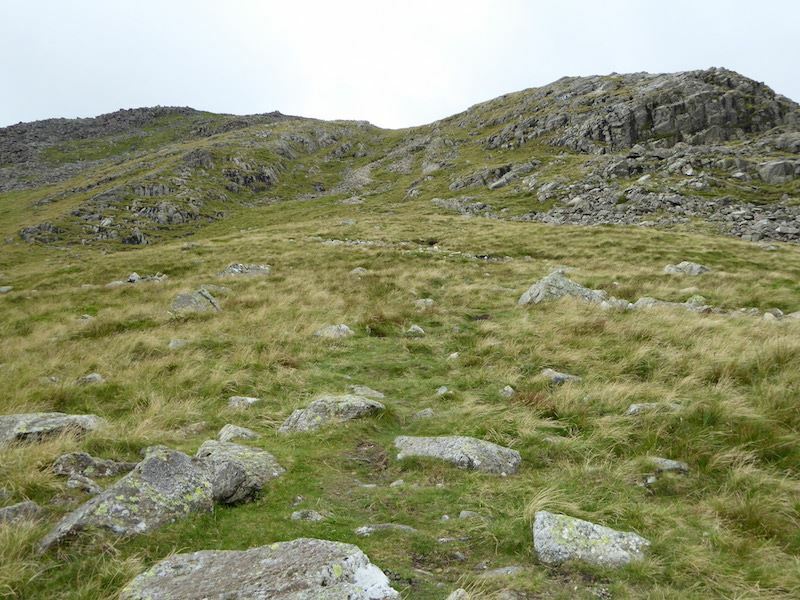 At the Hause we turn left and begin to deal with the ascent up Cofa Pike, its not nearly as intimidating as it looks once you are on it. 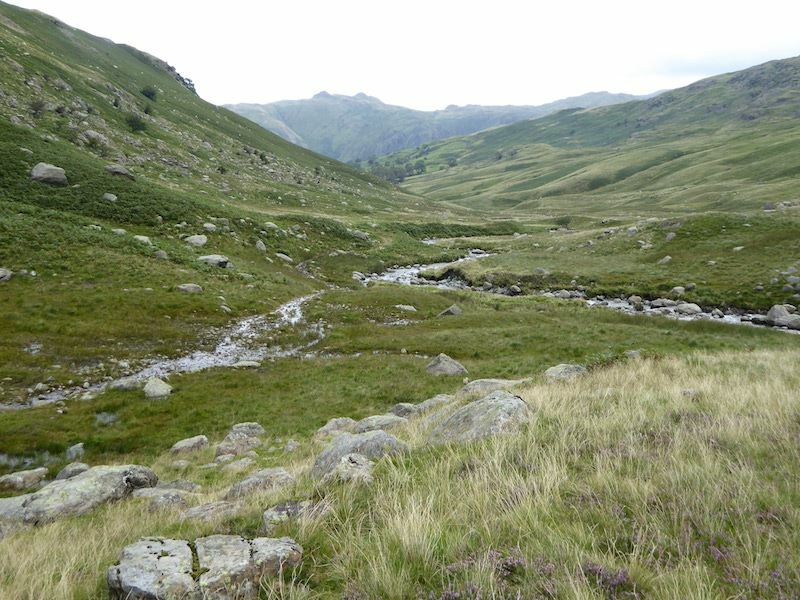 There’s a trodden route for the most part, although it can disappear now and then across rocky patches.That doesn’t present too much of a problem though if you just keep aiming for the next green patch and avoid straying too far over to the left. 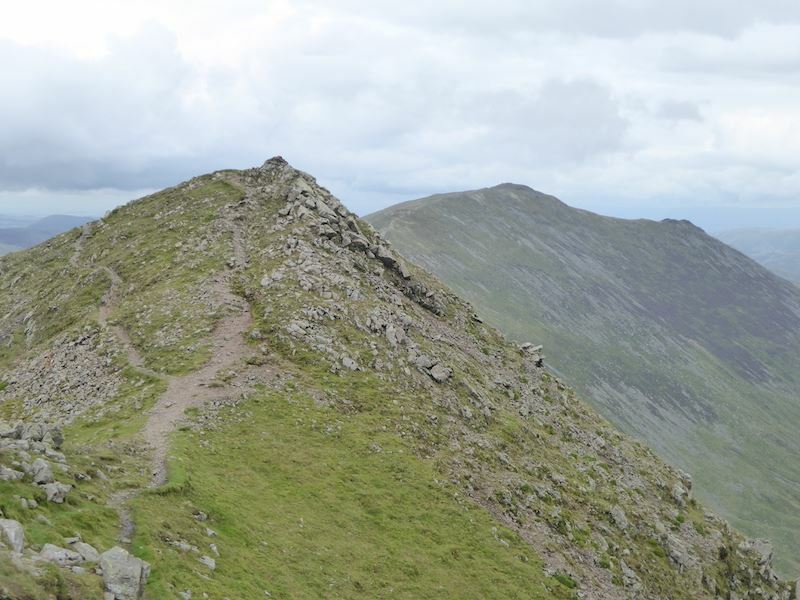 Its possible to omit the summit altogether by following a path which curves around it over to the right. 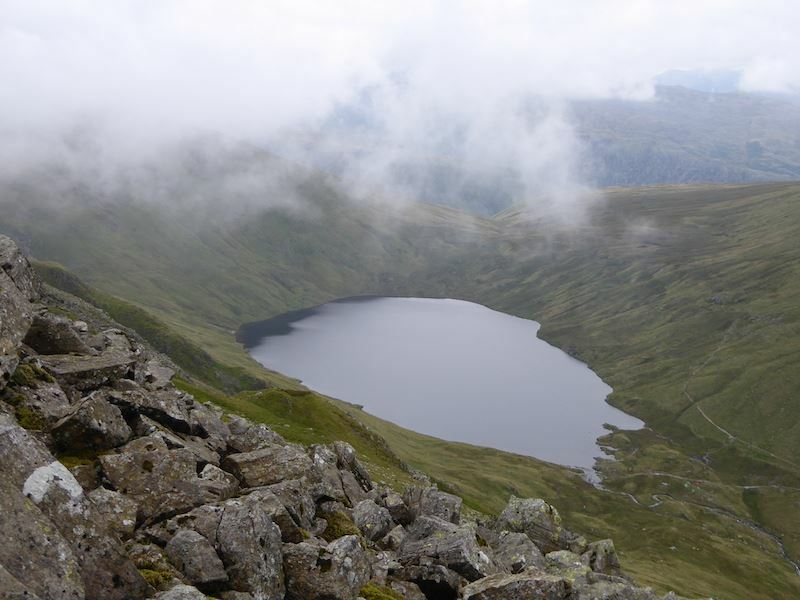 Grisedale Tarn from the ascent of Cofa Pike with Seat Sandal behind it. 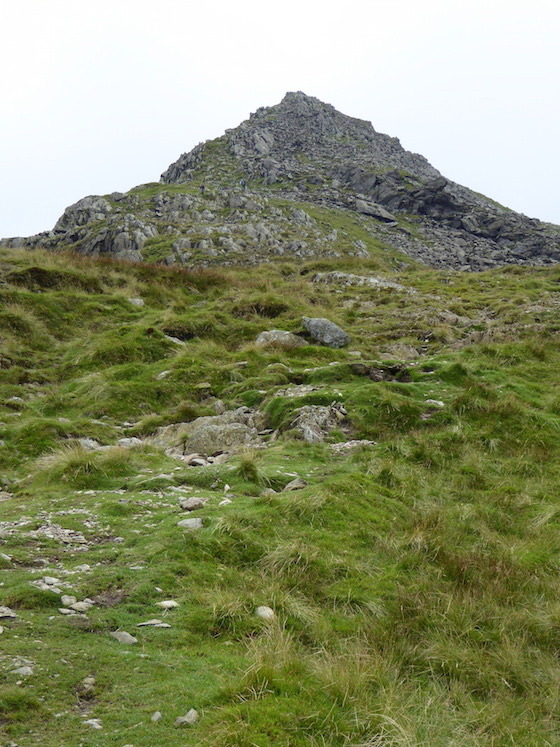 Our second encounter of the day as we ascend Cofa Pike. From their accents we guessed they were from one of the eastern European countries, but it was hard to make out which one. 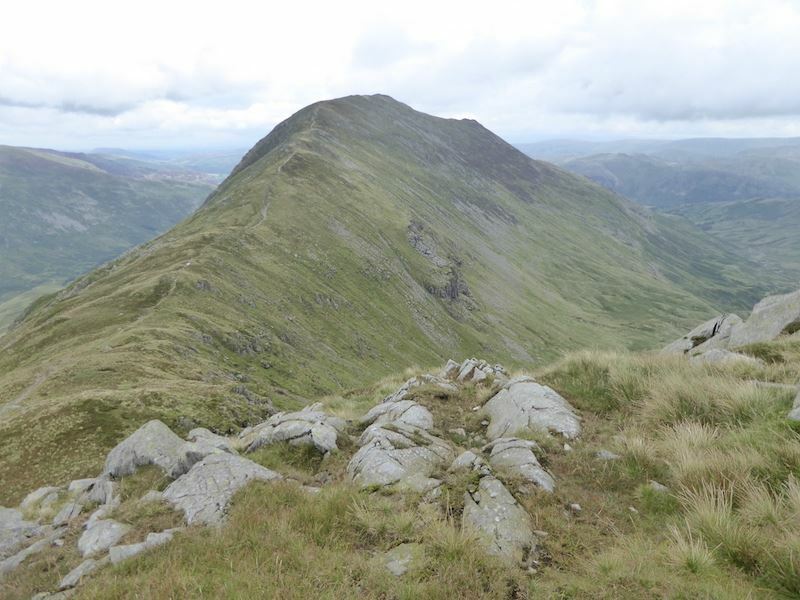 Saint Sunday Crag from the ascent of Cofa Pike. 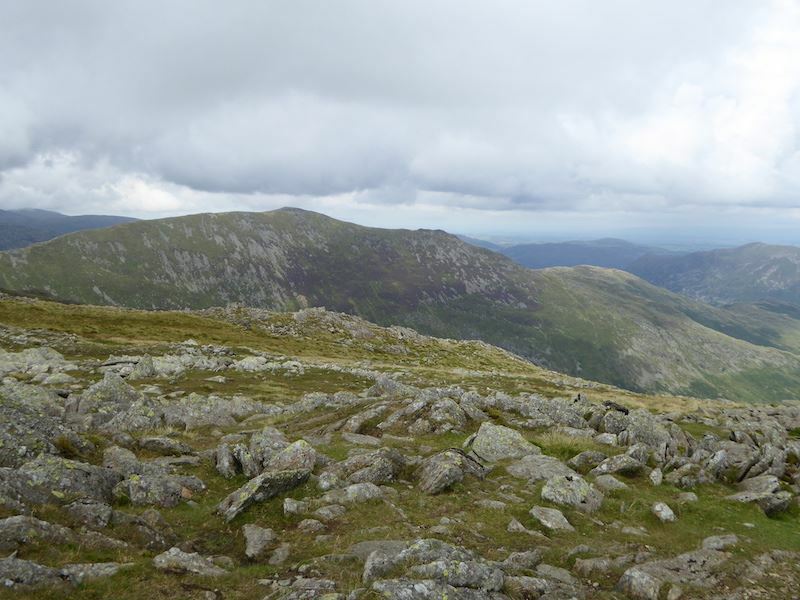 Also from the ascent of Cofa Pike a look across Grisedale to the Helvellyn range. 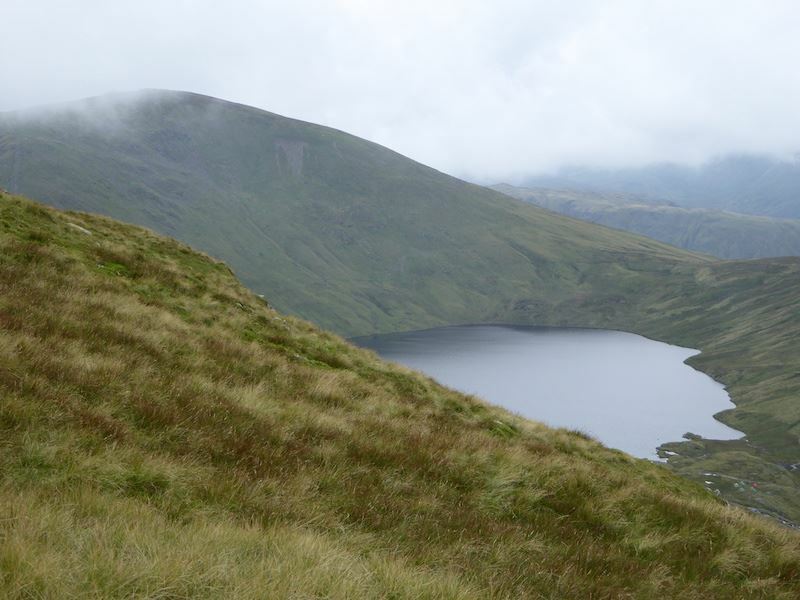 Seat Sandal is now hidden by cloud, but Grisedale tarn is still showing as we continue to climb Cofa Pike. 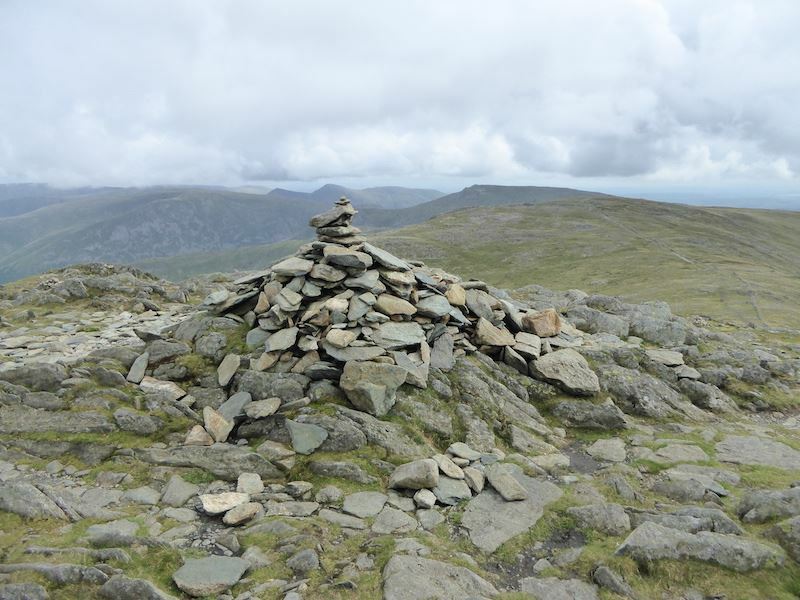 The cairn on top of Cofa Pike. 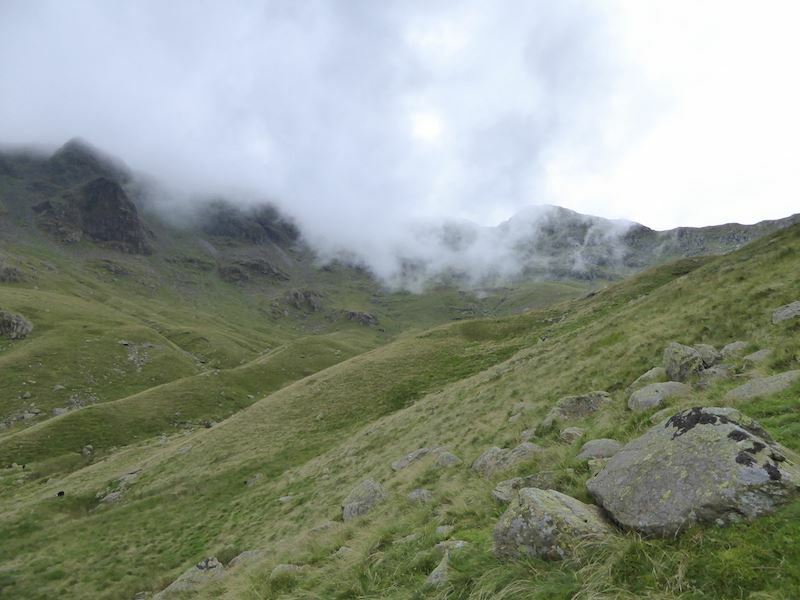 Cloud is still swirling around and blocking the views of the crags beyond Cofa Pike. That’s a bit of a nuisance as I would have liked a few shots of them, oh well, better luck next time I suppose. 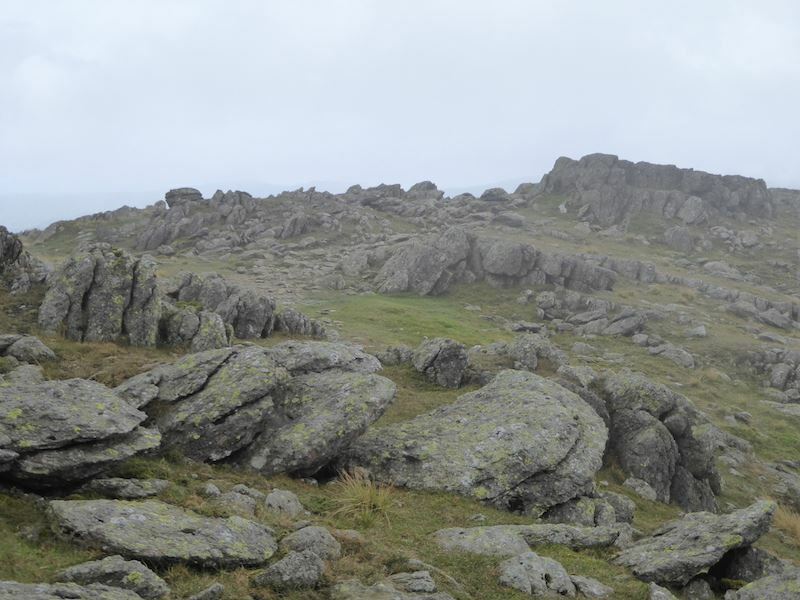 Moving down from Cofa Pike, so now its over the little rock outcrop and then on up to Fairfield which is now clear of cloud. 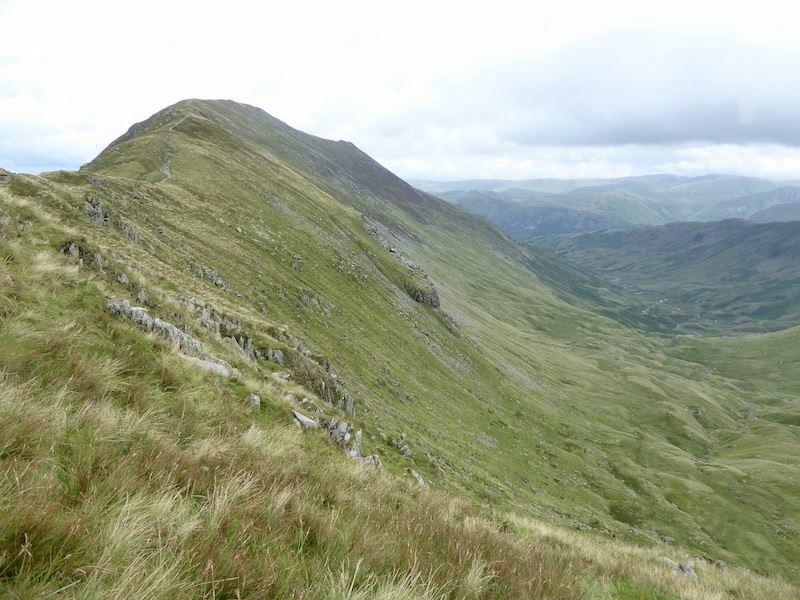 Looking back at Cofa Pike and Saint Sunday Crag. 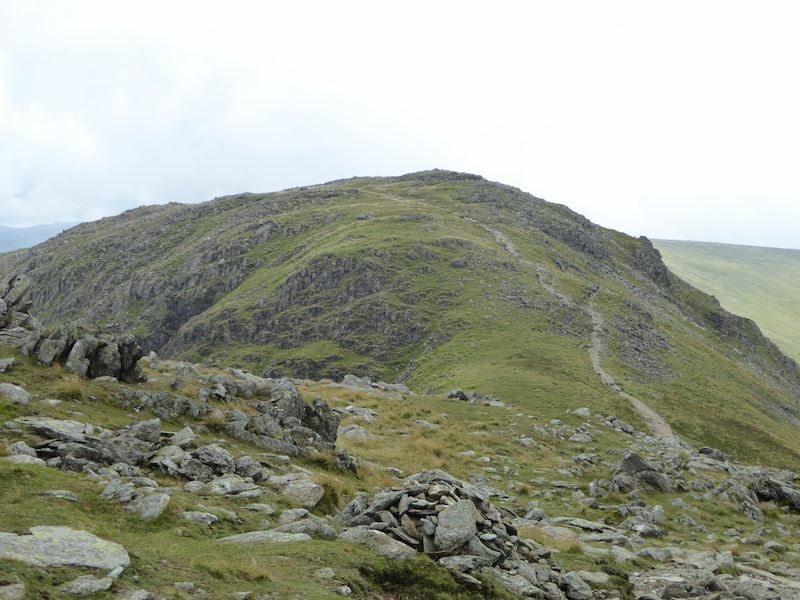 The path avoiding the summit of Cofa Pike now showing on the left of the shot. 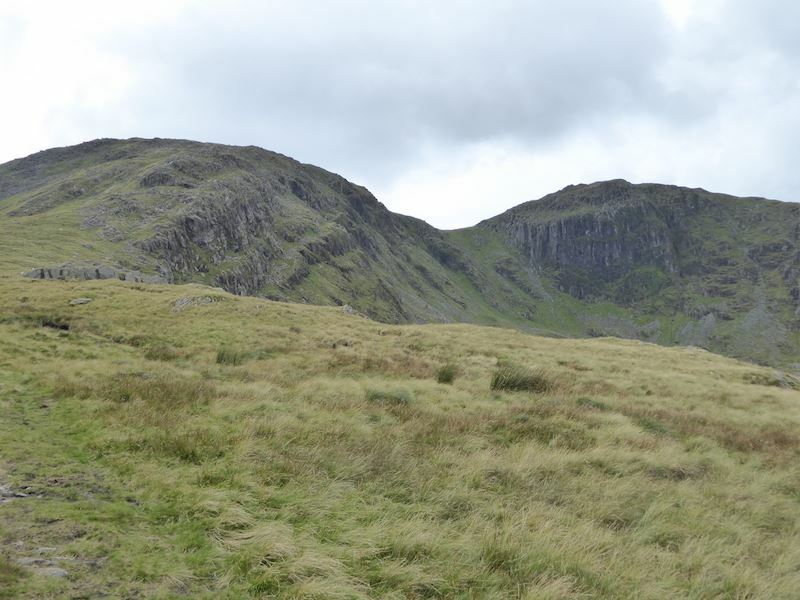 The last little outcrop with Cofa Pike behind it, and Saint Sunday Crag behind that. 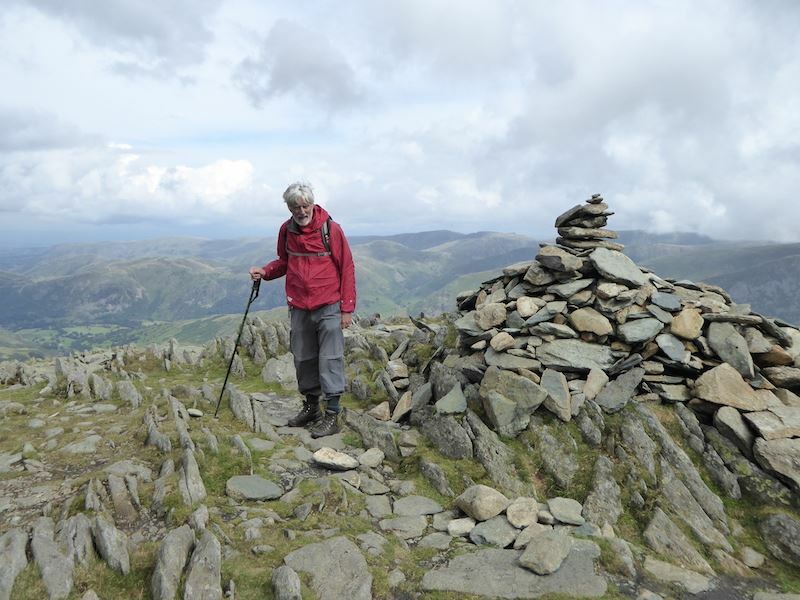 Getting across the outcrop isn’t difficult and its fine if you have long legs, those of us who are rather shorter in the leg department find the larger rocks on the top are rather awkwardly placed. This can lead to some unbecoming postures for the clamberer and merriment for onlookers. 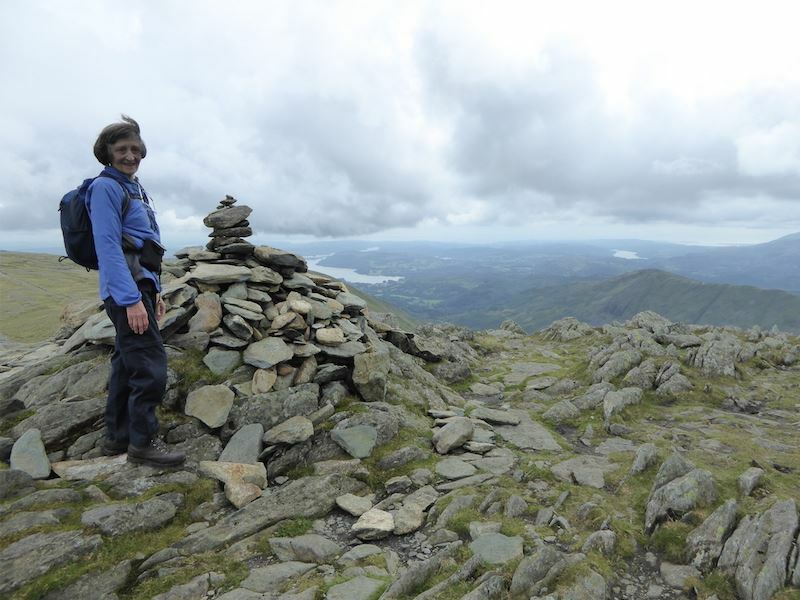 Up on the top of Fairfield which was busy with lots of ‘Fairfield Horseshoe’ walkers. 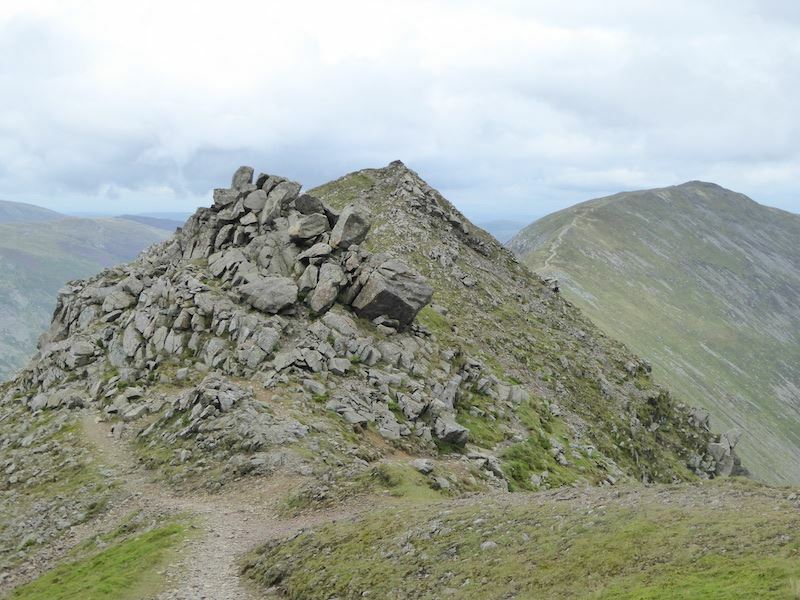 A look back at Cofa Pike, now with some more walkers on its summit. 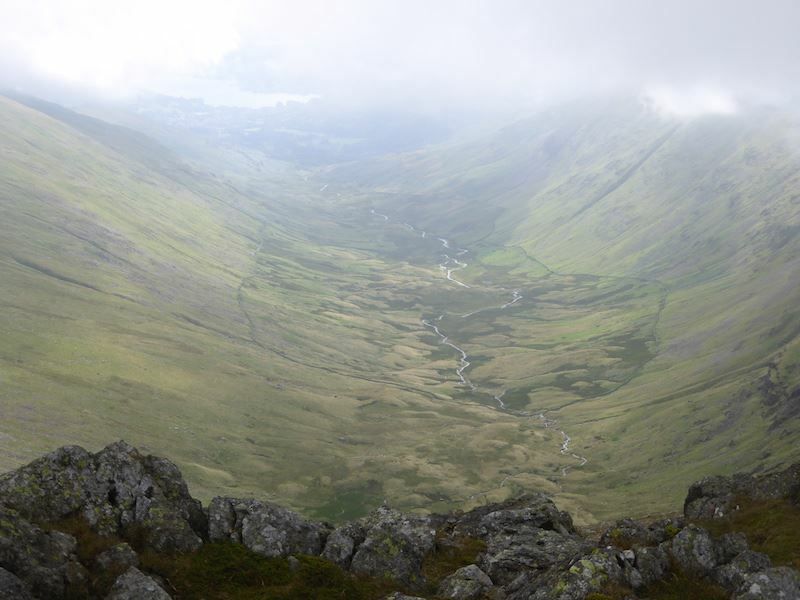 Looking down Deepdale from Fairfield. Alas, the cloud thickened again so no more photos for a good while. 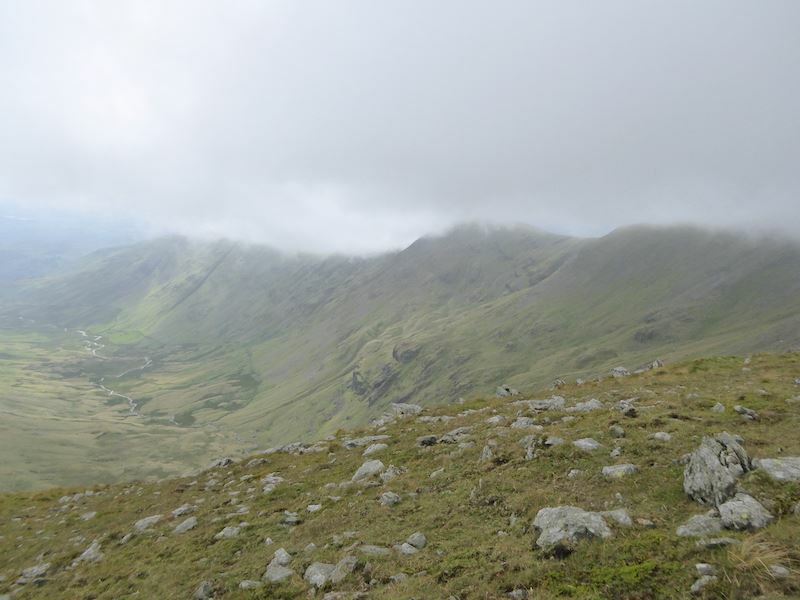 We walked off Fairfield in thick cloud with visibility down to just a few yards and began to make our way over to Hart Crag. 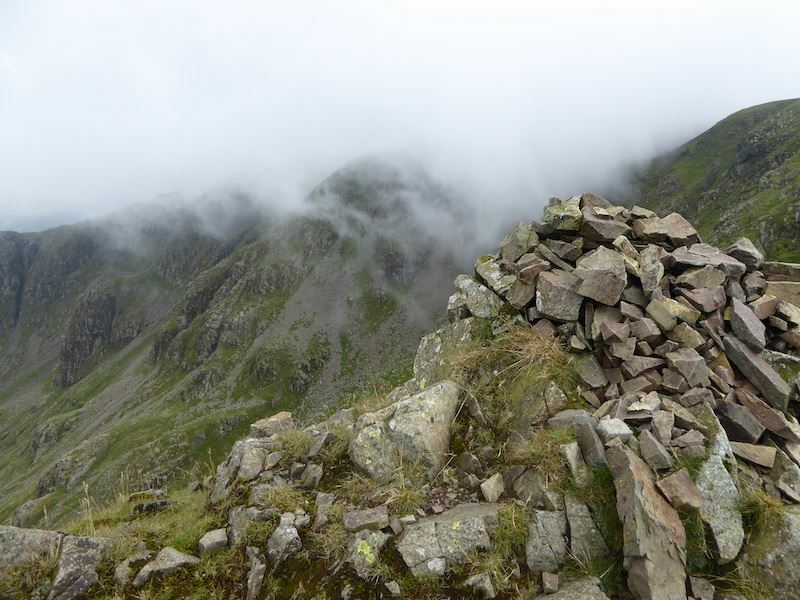 Cloud was constantly coming and going so photos were limited to what was just in front of us, in this case the rocky area over Link Hause, as we headed for Hart Crag. 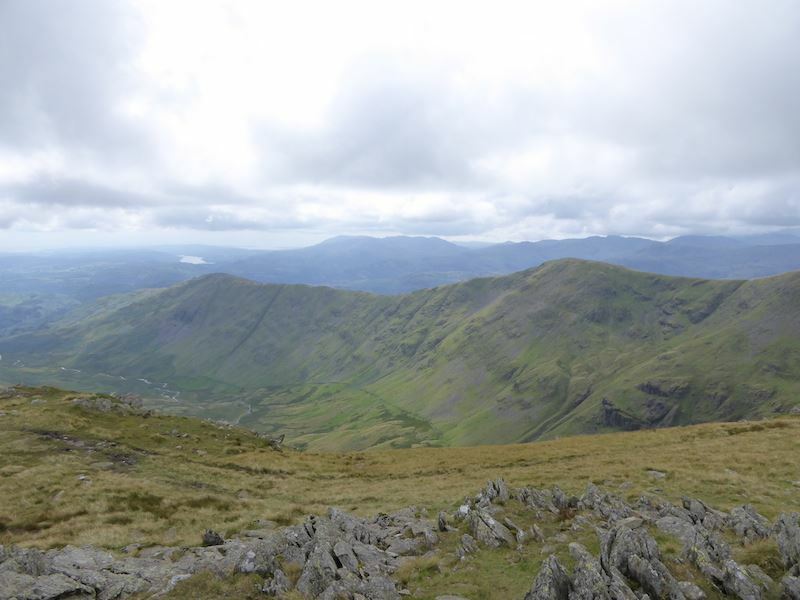 The western side of a cloudy Fairfield Horseshoe, showing Heron Pike, Great Rigg and Fairfield. Windermere appears as the cloud lifts a little. 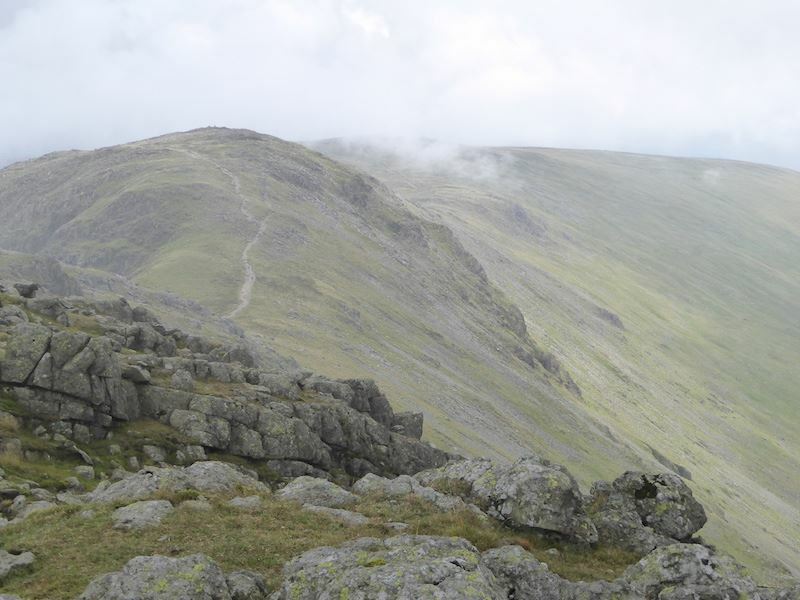 Finally we are now out of the cloud and the way is clear to Hart Crag. 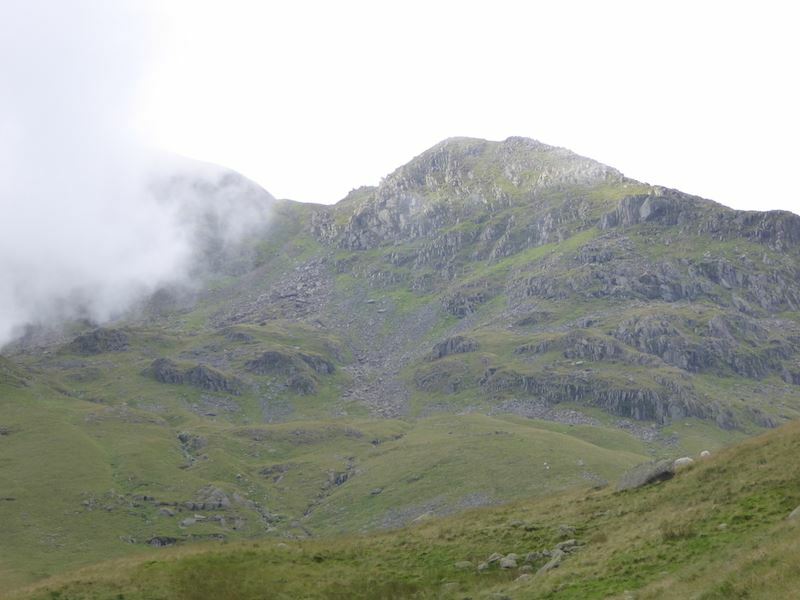 That’s more like it, now we can see the Coniston fells over on the skyline. 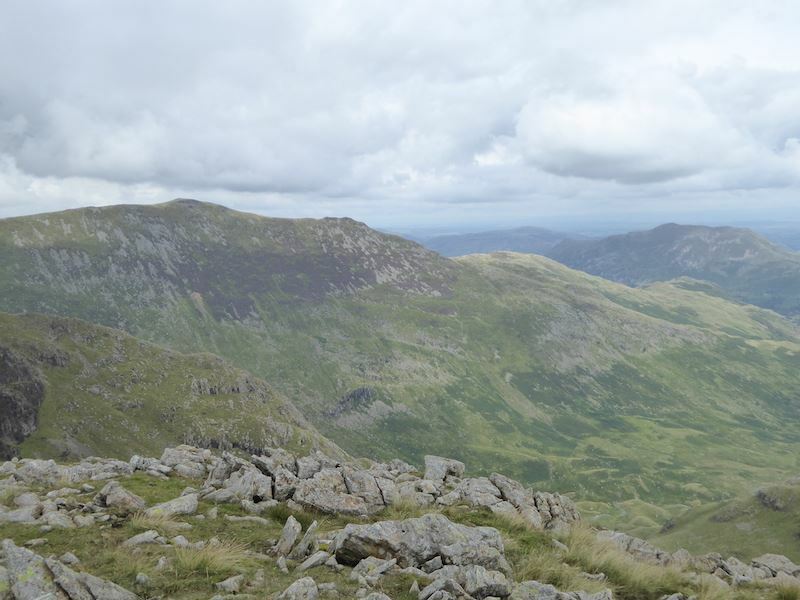 From Hart Crag looking back over to Fairfield from where we have just walked. People still arriving at the summit. 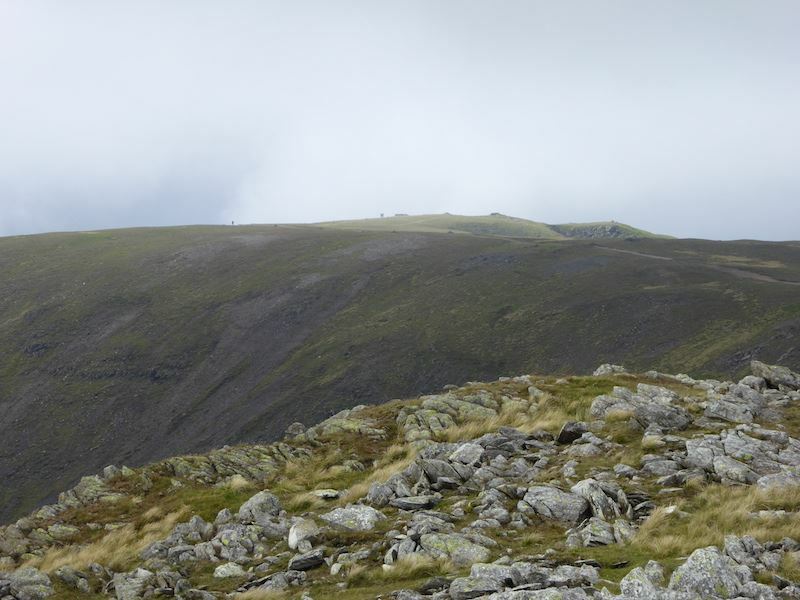 Hart Crag summit and the fells to the east. 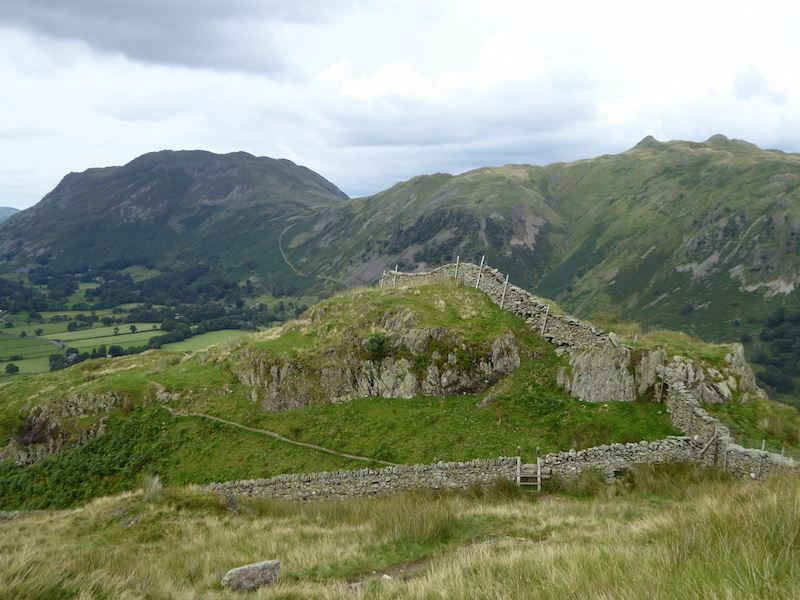 Looking over to Saint Sunday Crag from Hart Crag. 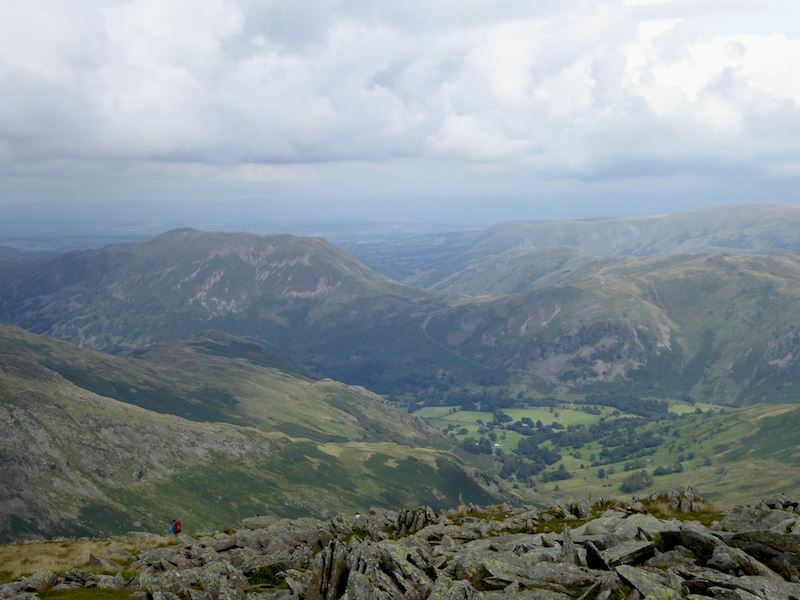 Looking east from Hart Crag with Place Fell on the left being the most distinctive. 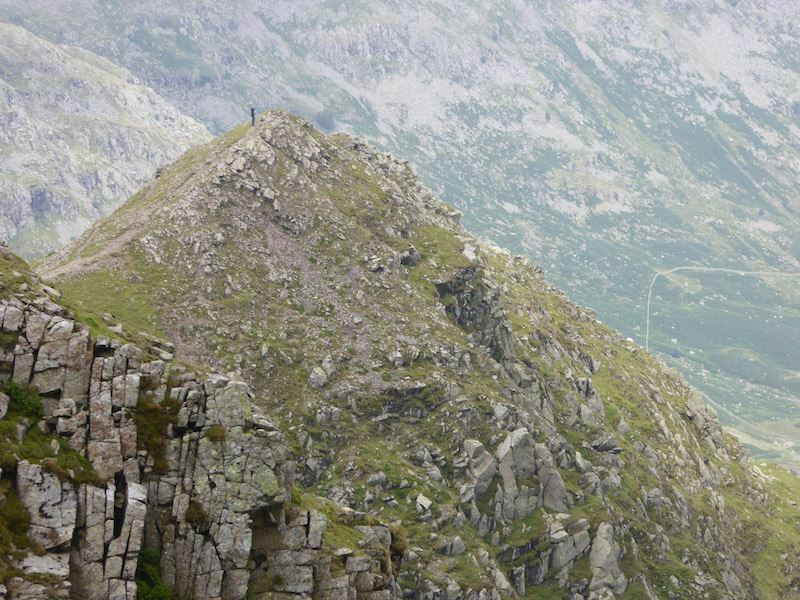 Other walkers below us gingerly picking their way through the rocks as they make their descent. 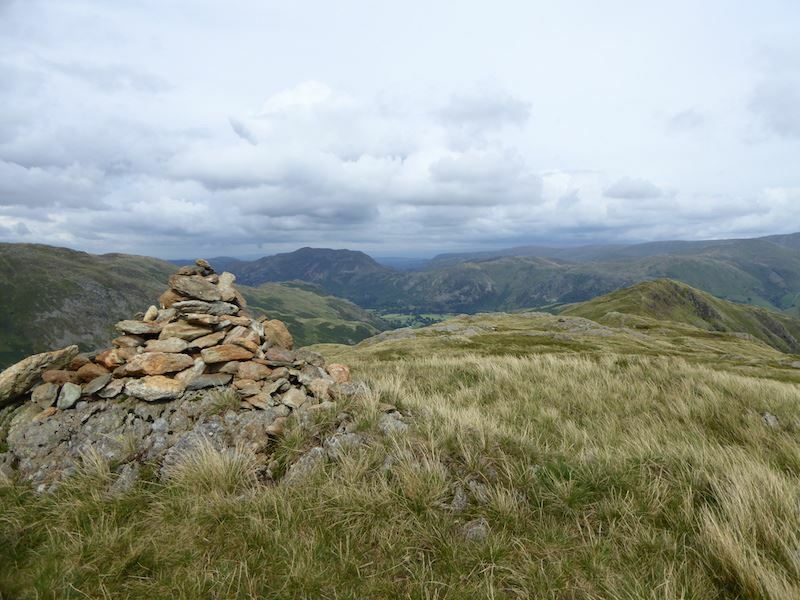 Still looking eastward from Hart Crag summit. 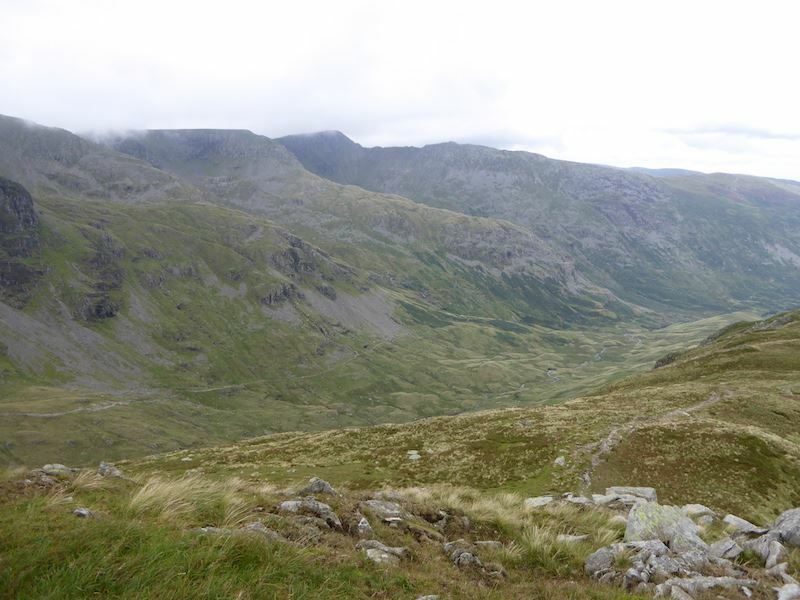 Looking north-eastwards from Hart Crag. 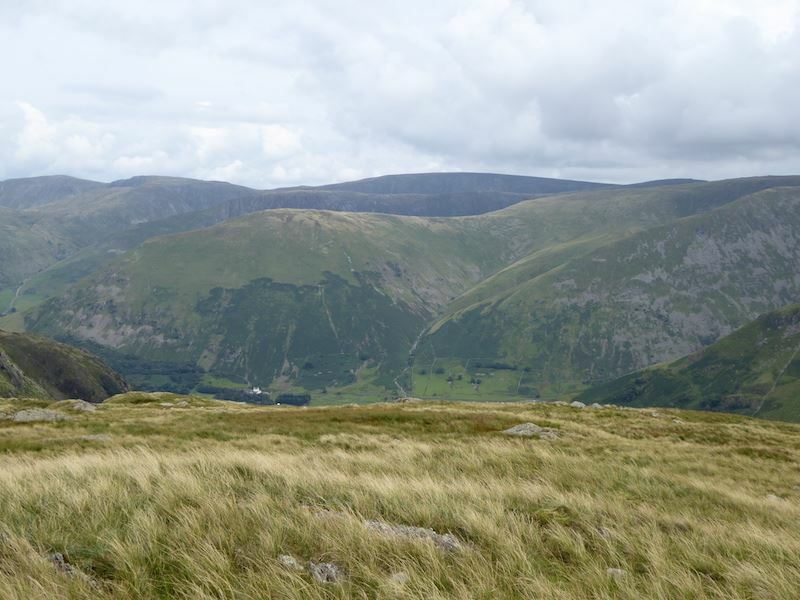 Ullswater can be seen just behind the cairn, and over in the distance on the right is Haweswater. 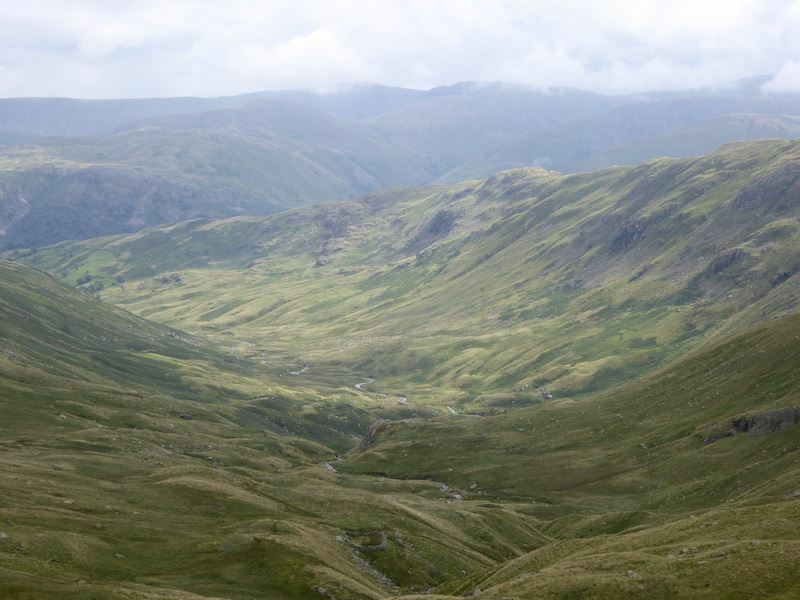 The darkish, flat topped fell over on the right skyline is Red Screes. 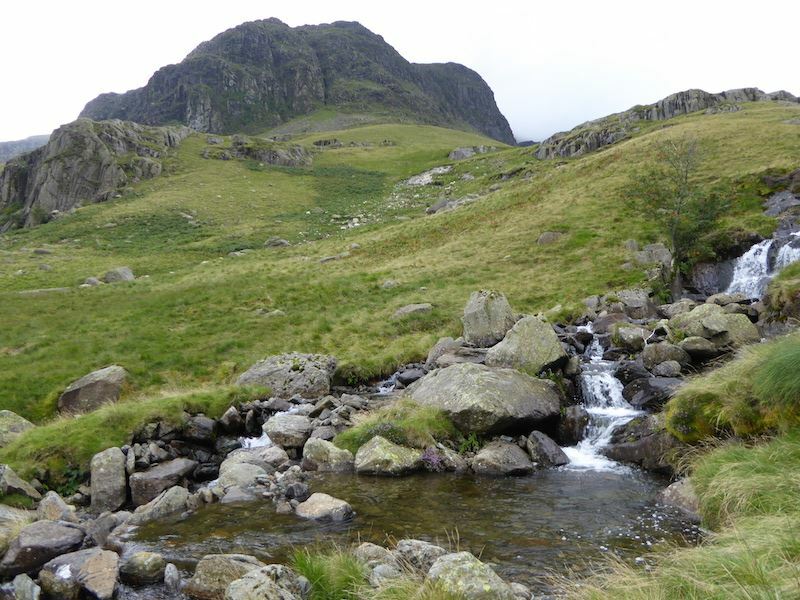 Saint Sunday Crag across Deepdale. 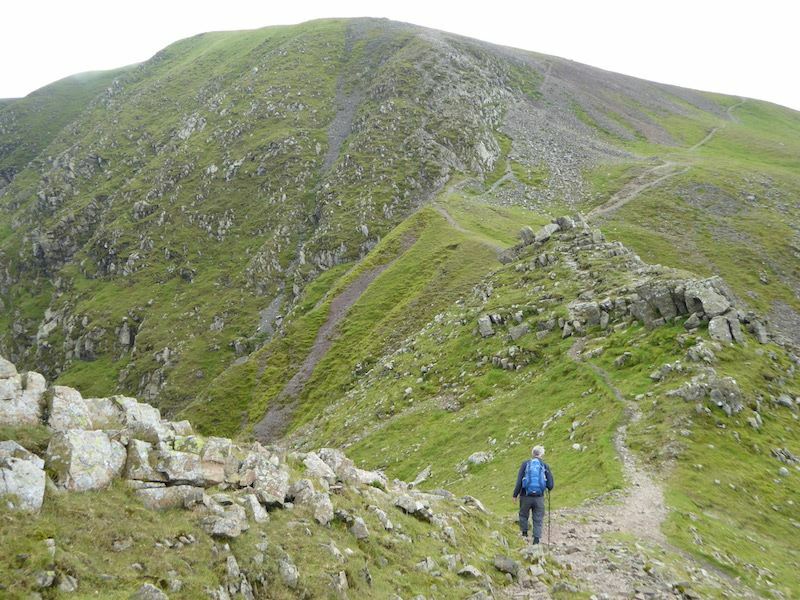 That’s where we’re heading next, the long, long ridge down Hartsop above How. 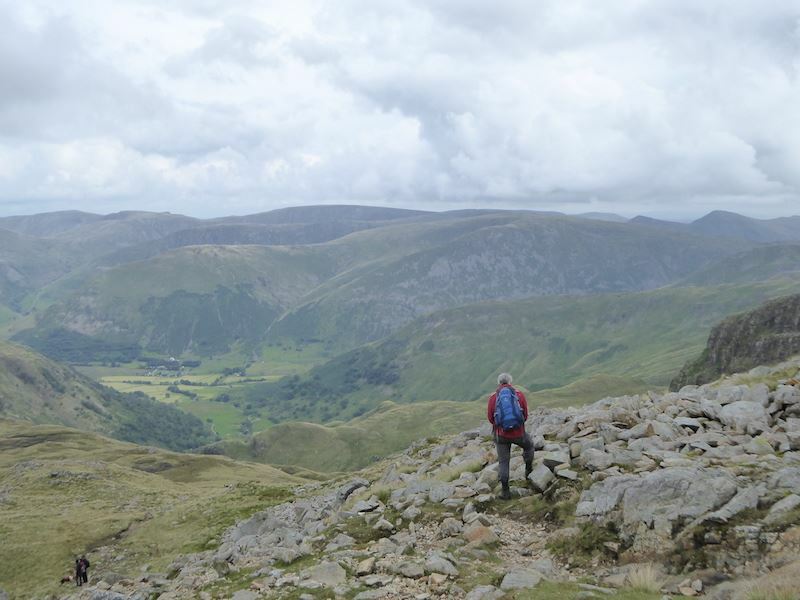 Looking over at the eastern fells and contemplating the descent route off Hart Crag. 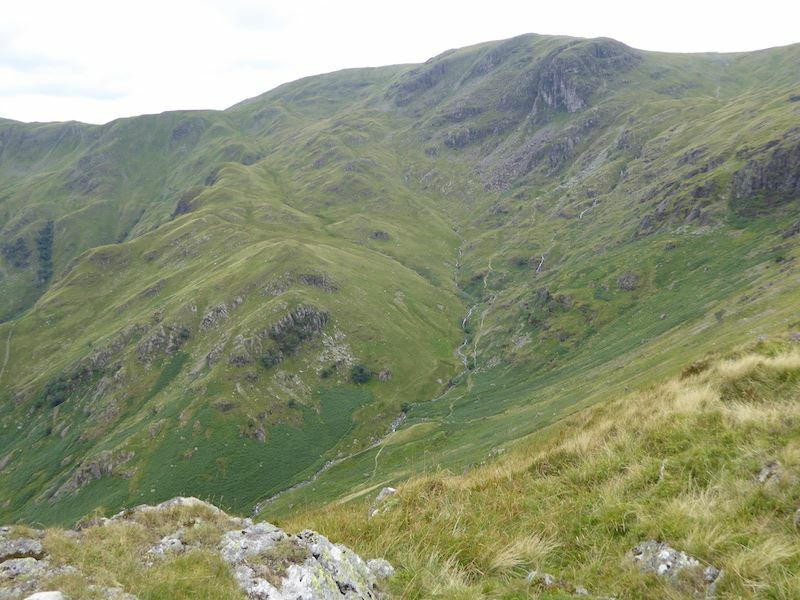 Descending from Hart Crag and a view of Dove Crag across Dovedale. 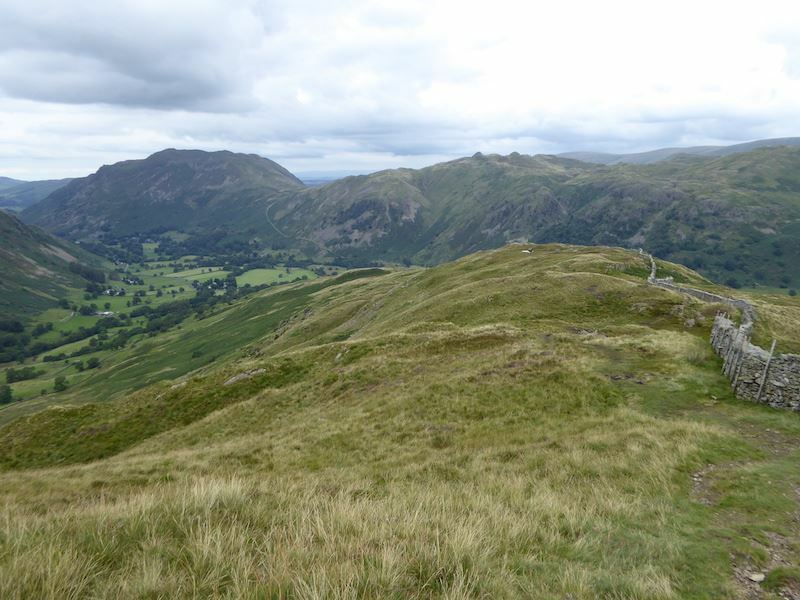 Looking back at the descent route from Hart Crag. A large group of very loud and talkative teenagers making their way down too. They caught up with us a little lower down when we stopped for a drinks break. How the group leaders put up with one of the boys was beyond me as his very loud and raucous behaviour bordered on insolent. He persisted in asking quite ridiculous questions and seemed intent provoking them and trying to create some sort of reaction. He failed, though how they kept their patience I don’t know, mine had dissipated well before they reached us. 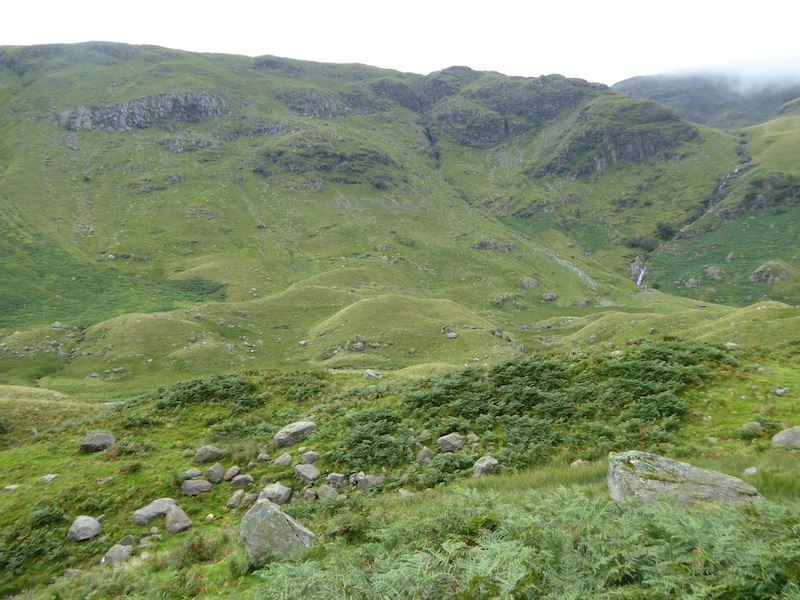 Another look back at Hart Crag on the left with Scrubby Crag over on the right. 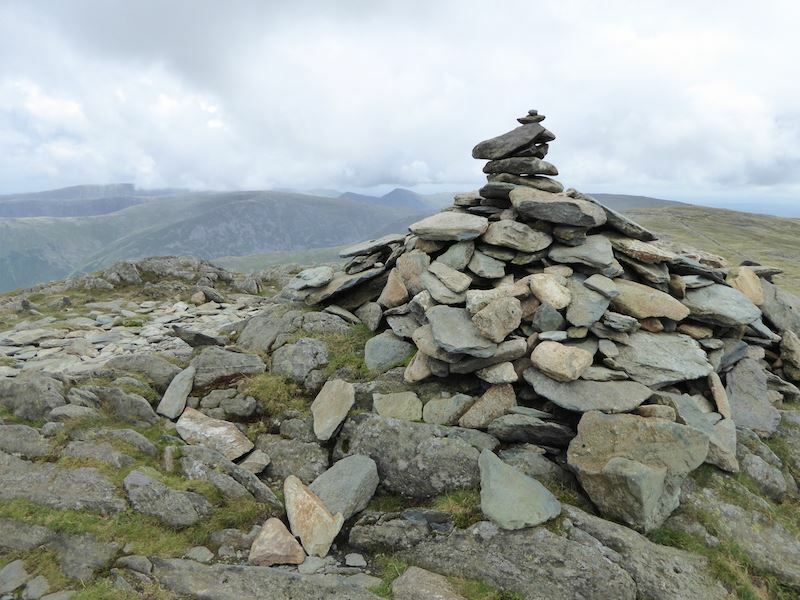 The summit cairn on Hartsop above How where we stopped for drinks. We didn’t really need drinks but we were both heartily sick of the loud behaviour of the lad in the group behind us. We downed packs and stopped here long enough for them to get a good distance ahead of us and out of earshot. 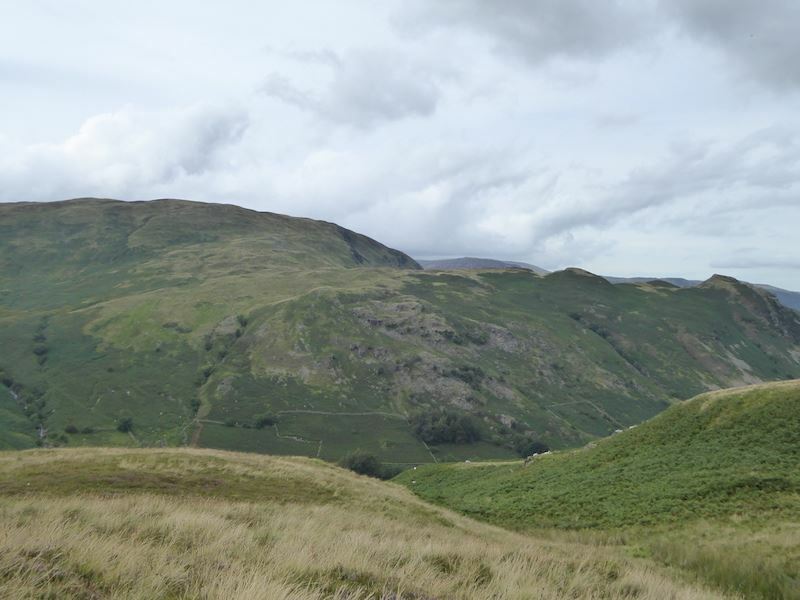 Looking acrross Dovedale to Red Screes and the ridge which descends down to Middle Dodd. 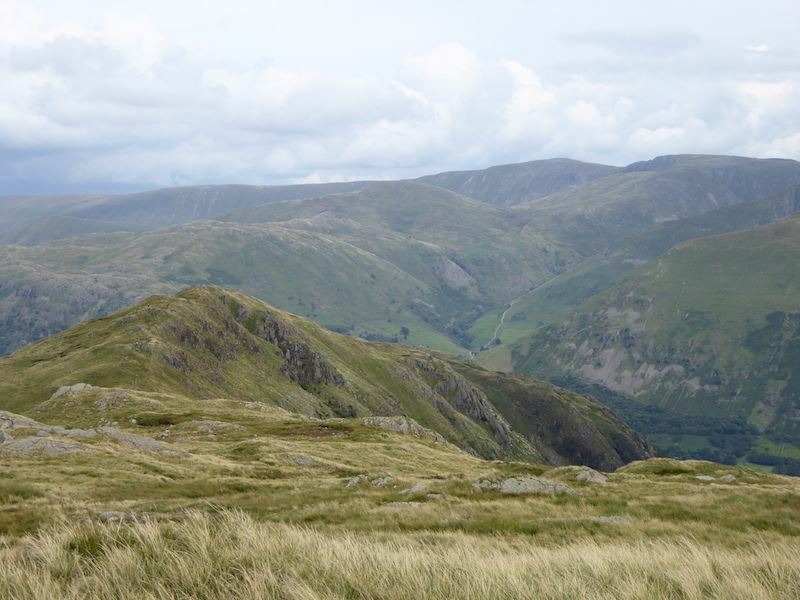 Another view across to the eastern fells with High Street on the skyline. 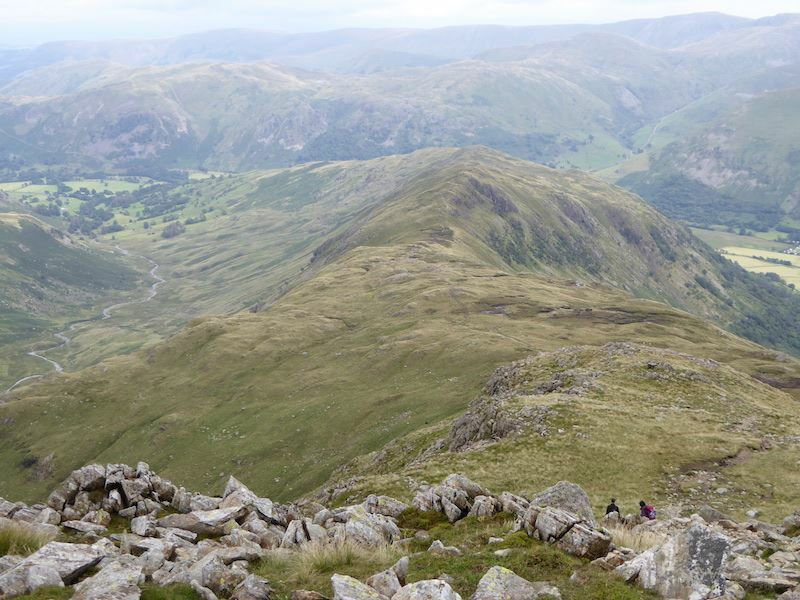 Still at the cairn and looking down at the rest of the Hartsop above How ridge. 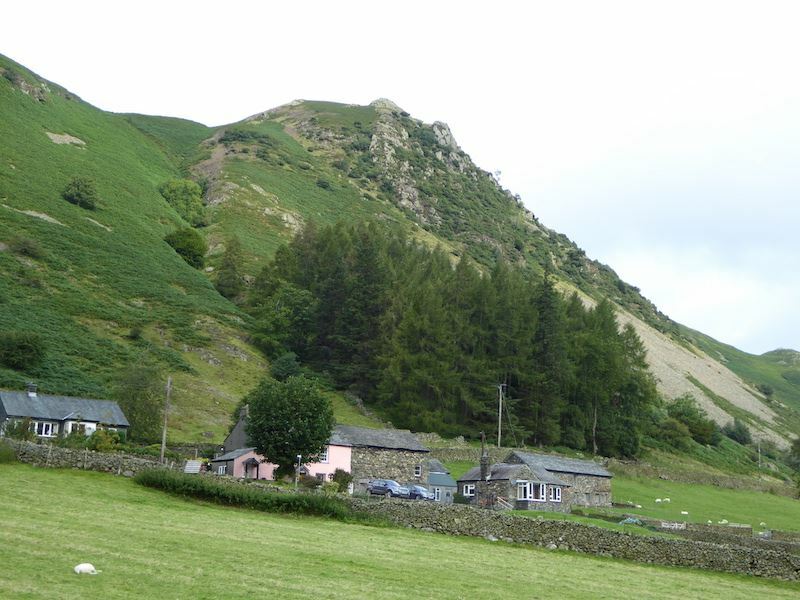 Looking over into Dovedale and Dove Crag at the head of it. 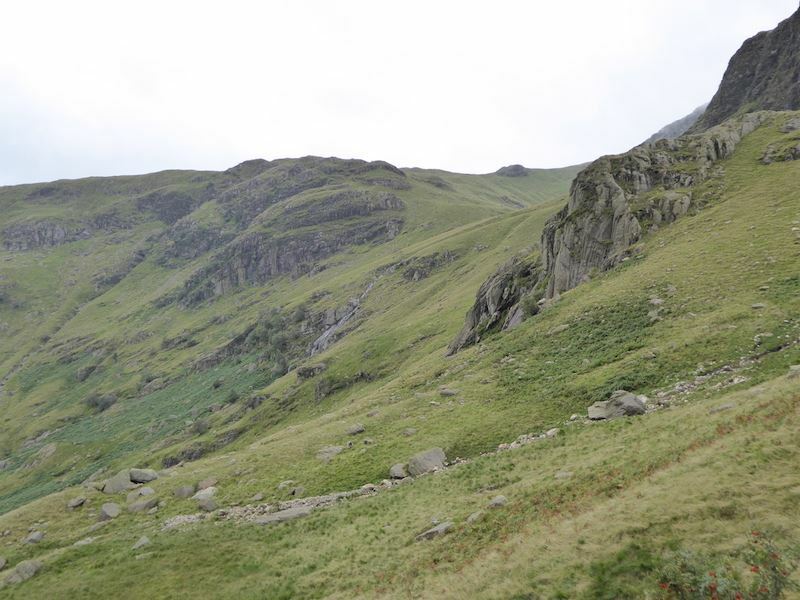 On we go, making our way through the soggy, boggy mess along Hartsop above How. 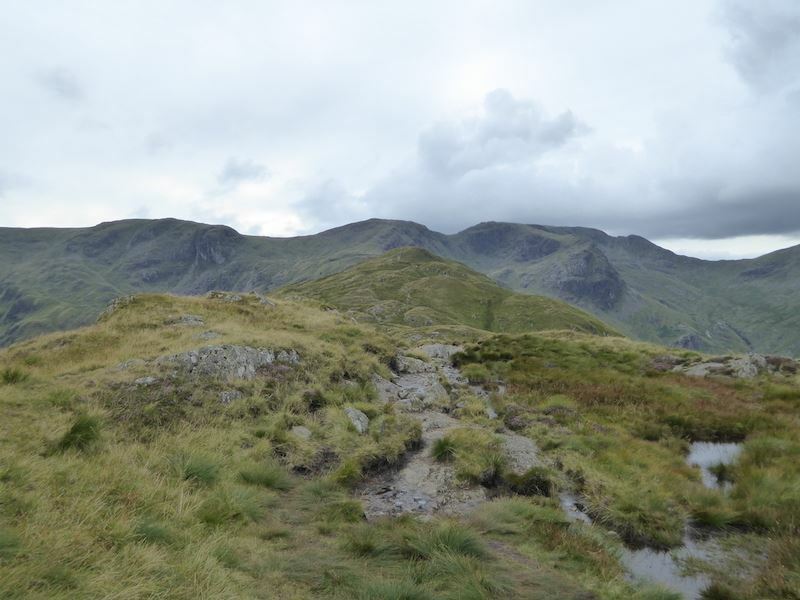 Looking back at some of where we’ve been, from left to right is Dove Crag, Hart Crag, Fairfield, Cofa Pike and Deepdale Hause. 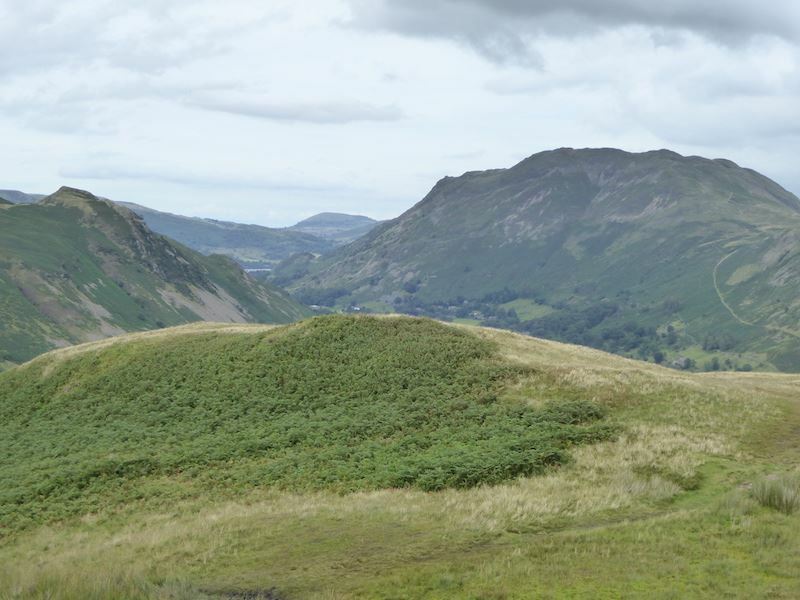 Place Fell and Angletarn Pikes, always in view as the valley bottom starts to appear at last. 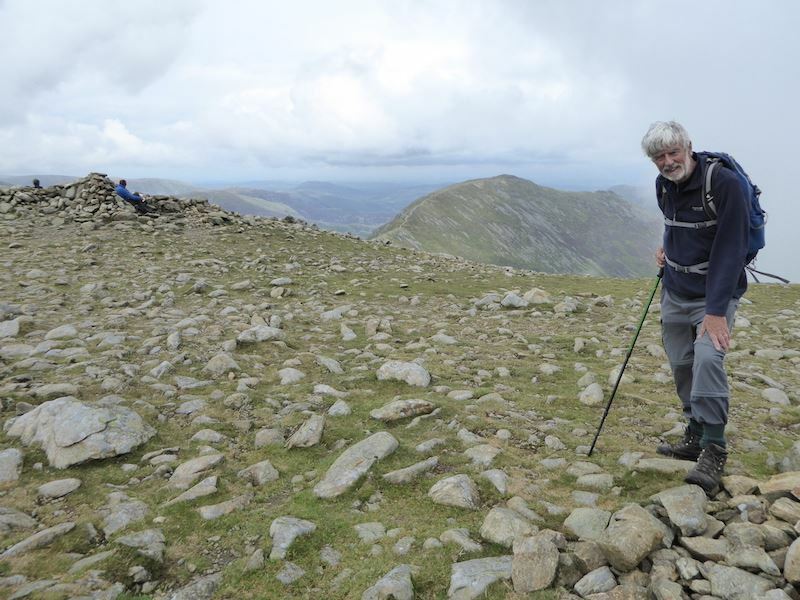 Unfortunately we caught up with the noisy lad and the rest of his group somewhere back along the ridge and so had to go through the pain of it all over again. Mercifully they stopped for some reason so we quickened our pace and managed to leave them behind, permanently this time, hallelujah! 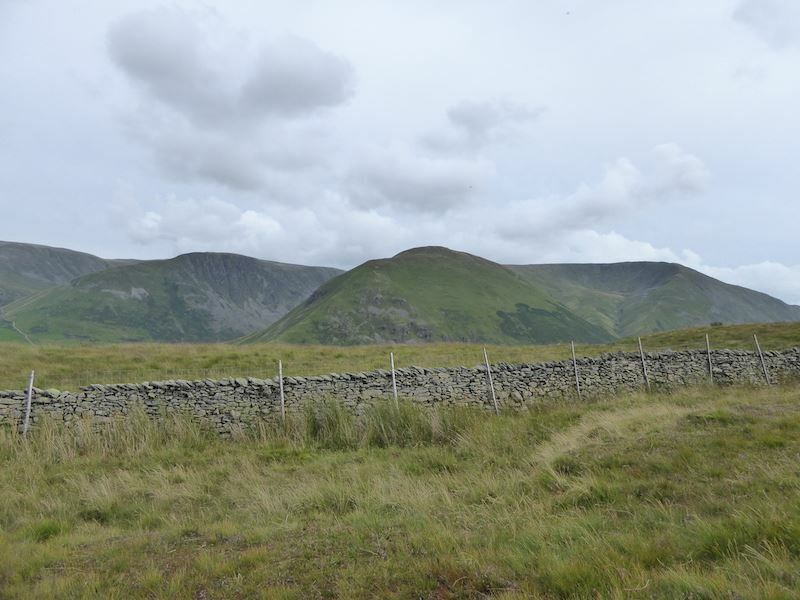 There’s no mistaking these two fells as you make your way along here. 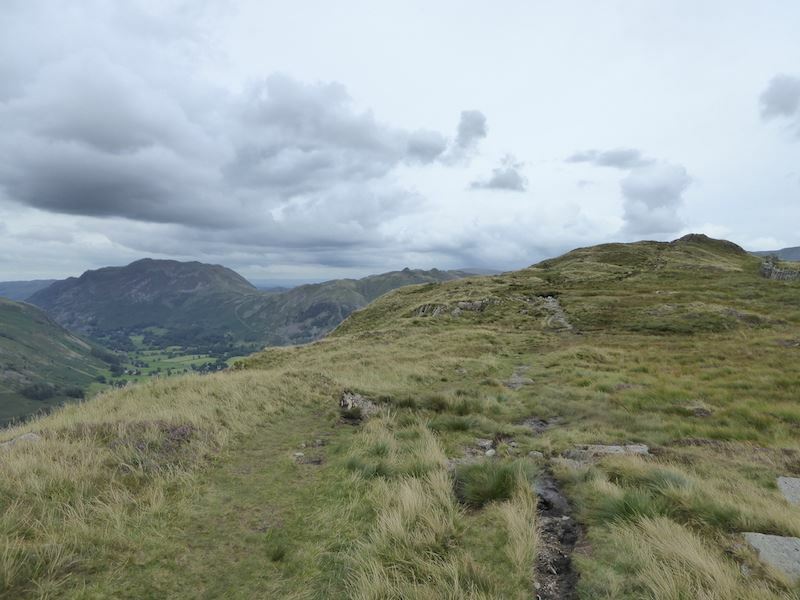 Over to the left is Birks on the left skyline, with Arnison Crag over on the far right of the photo. 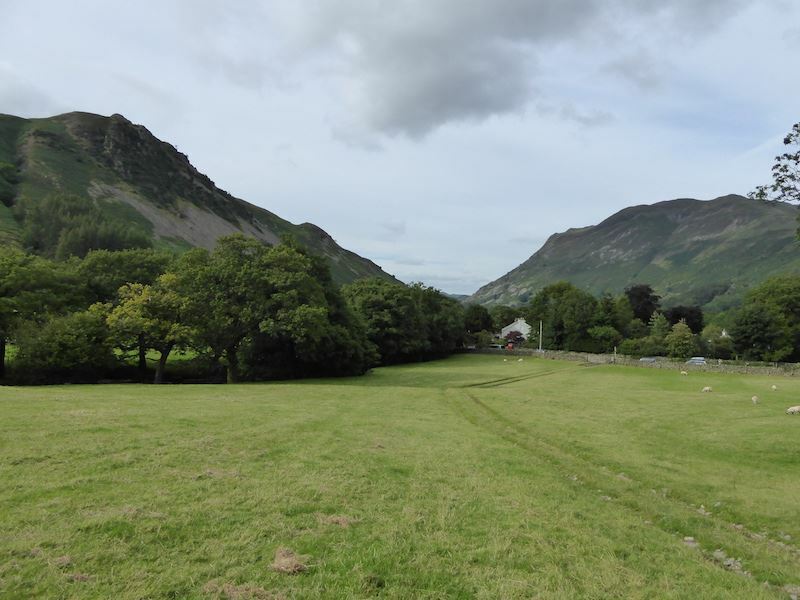 Arnison Crag on the left, Place Fell on the right, and with soft grass underfoot, the going just got a bit easier. 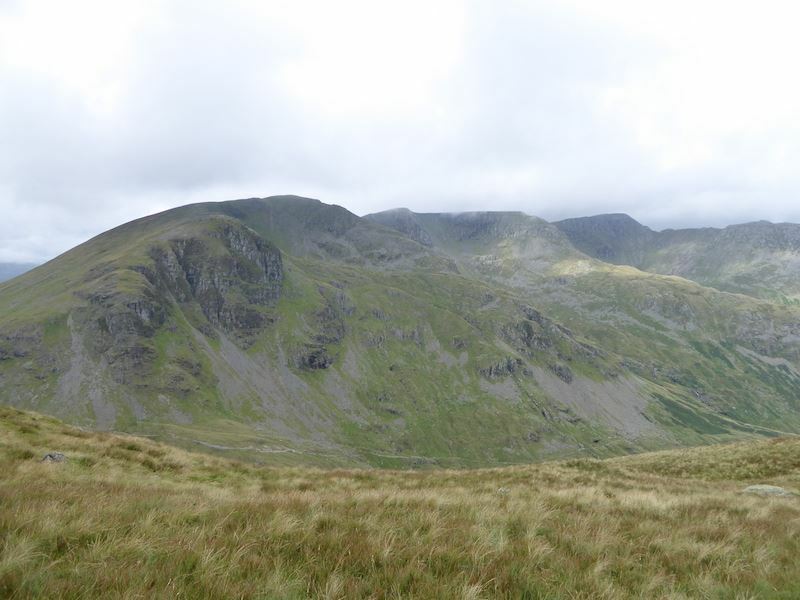 In the centre is Hartsop Dodd, to its right is Caudale Moor, and to its left is Gray Crag. 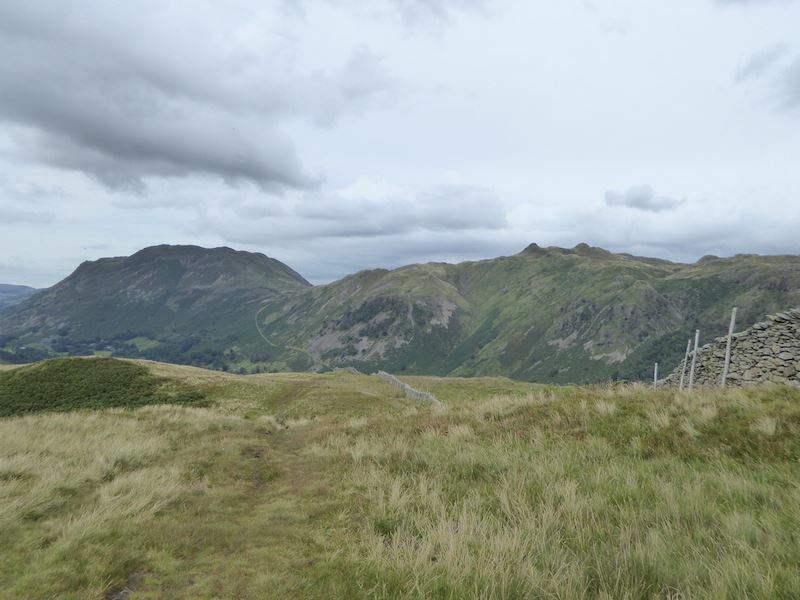 The stile is in view and there’s not a lot further to go now. The end of the walk is a stroll in the park, quite literally, and the car is parked just around the corner behind the white house. A cup of tea would be most welcome right now but there isn’t one handy so we’ll have to go home and make one ourselves.